We had a full day in Ottawa. The autumn weather had turned on us and it kept raining all day. 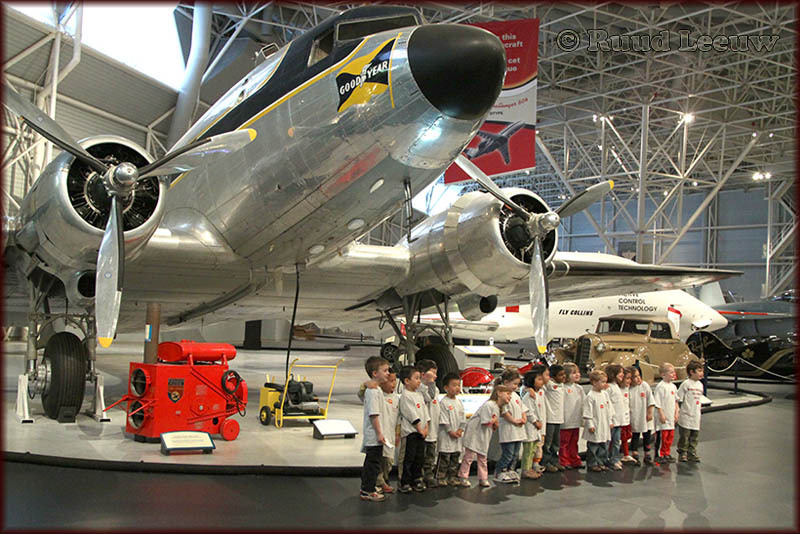 So we decided to opt for 2 (aviation) museums and a shopping mall. In itself not a difficult decision. You won't find anything on the shopping mall here! 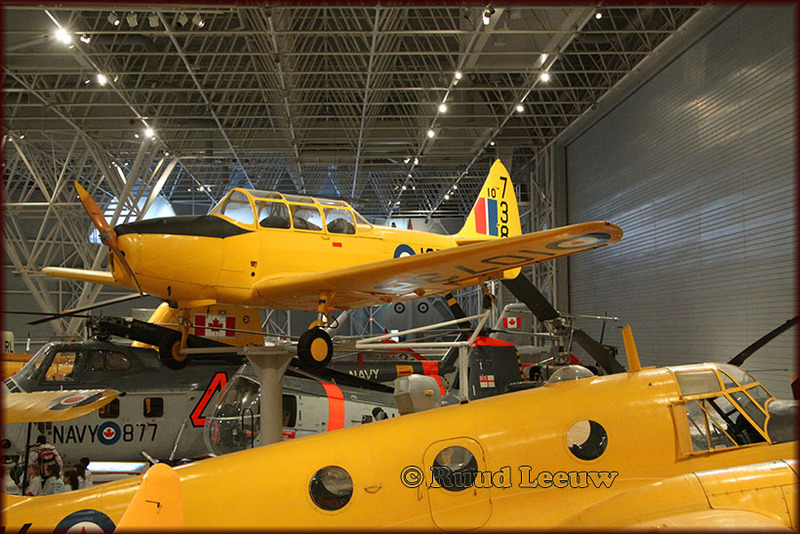 On this page we'll explore the Canada Aviation Museum. The visit was not without disappointment. When I had explored the main museum, I asked at the desk how I would get to the 2nd hall. And I was told that it was mainly a storage area and could only be visited during a guided visit; for the start of that tour I had to wait an hour. I wasn't prepared to wait that long, so I left that for another day. Pity that information wasn't made available to me when I bought the ticket, as that morning they had 2 groups doing tours. For the information in the captions I am largely indebted to the museum's excellent and informative website. Nice to be made welcome! 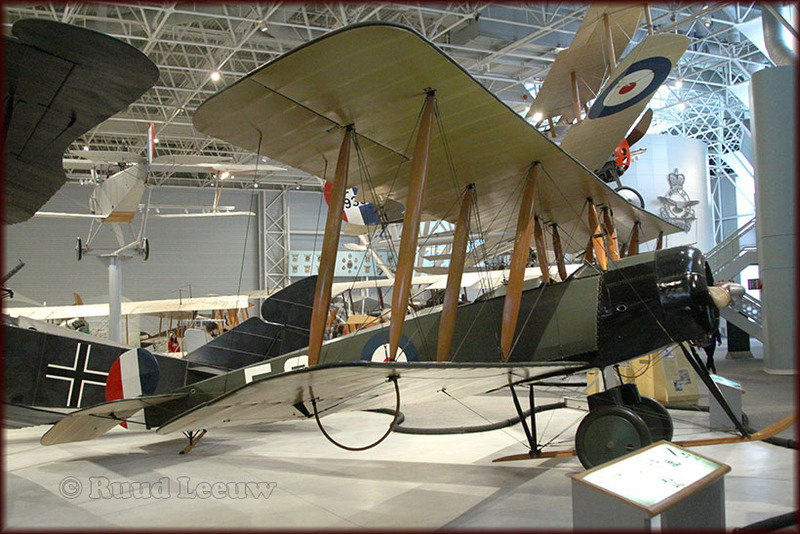 In 1918 the Royal Air Force sought a flying field in the Ottawa area for experimental mail flights. A field behind a military rifle range located on the banks of the Ottawa River in Rockcliffe Park, several kilometres downstream from Ottawa was converted to an airstrip and became known as the Rockcliffe Air Station. 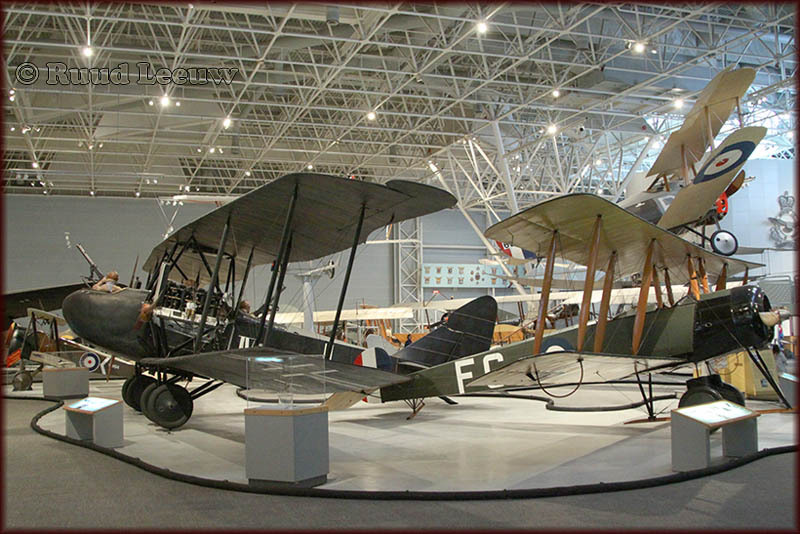 After the Canadian Parliament's 1920 Air Regulations came into effect, the Rockcliffe Air Station was chosen as an ideal site for supporting both an air harbour and a flying field. 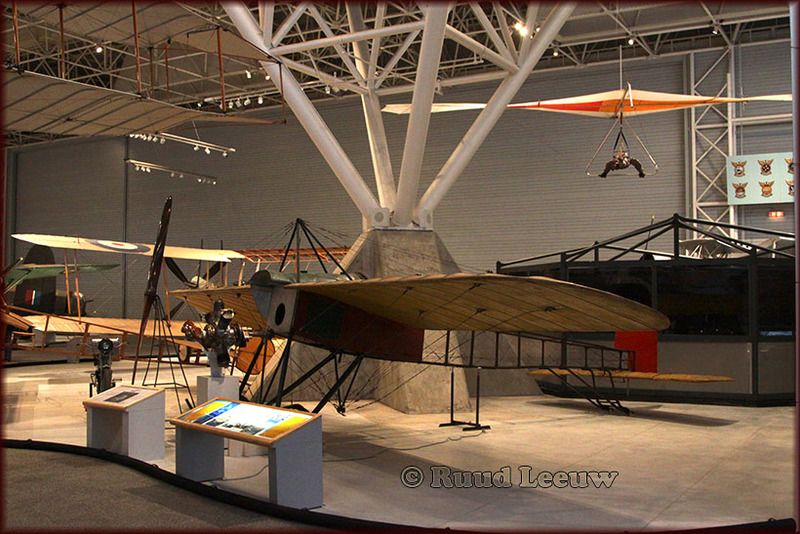 The new air harbour, or airport, opened later in 1920 as the Ottawa Air Station, and was one of the 6 original airfields opened across Canada by the new Air Board. 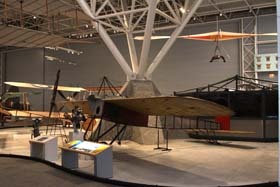 Major activities conducted by the Air Board at the Ottawa Air Station included military aerial photography for topographic mapping in Canada, air transportation, and aeronautical experimentation. The airport also served as a major centre for early aircraft testing. 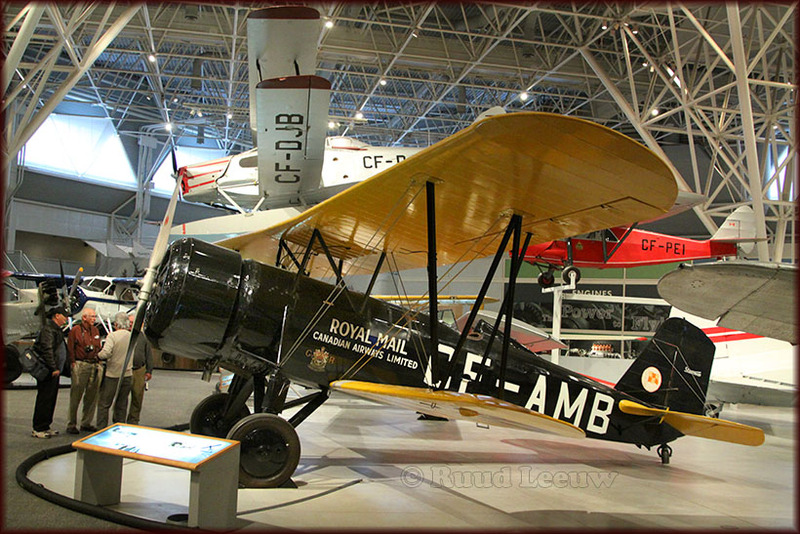 In 1922 the civilian components of the Air Board began to consolidate into the Canadian Air Force, which became part of the newly-established Department of National Defence the following year and was renamed the Royal Canadian Air Force (RCAF) in 1924. 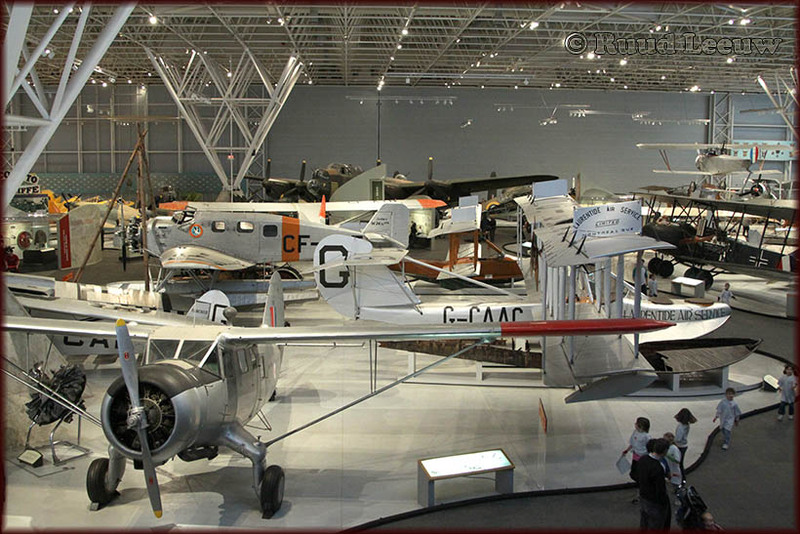 After a few name changes, the facility took the name RCAF Station Ottawa in 1936. In 1940, this name would change again to RCAF Station Rockcliffe. On March 12, 1930, Canadian World War I flying ace William George Barker crashed into the Ottawa River and died during an aerial demonstration over the field. In July 1931, Charles Lindbergh and Anne Morrow Lindbergh visited the airport during their northern surveying tour. The airfield's runways were paved in 1939 in preparation for operations during World War II. 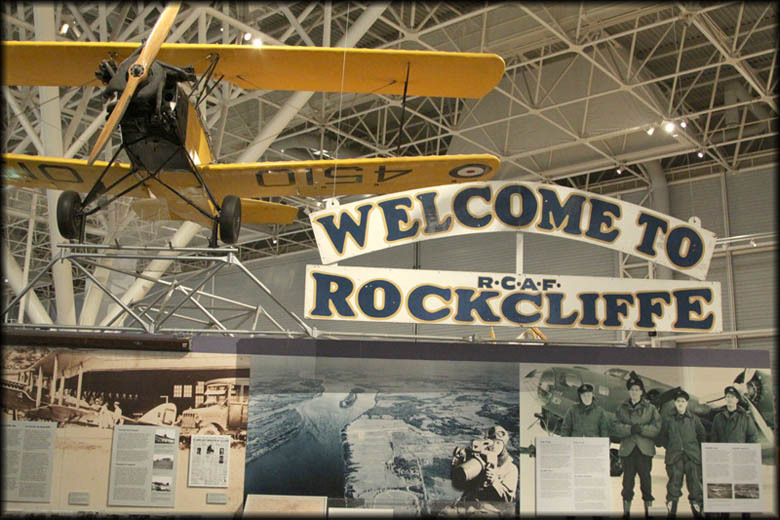 RCAF Station Rockliffe participated in the British Commonwealth Air Training Program and — as the nearest airport to the centre of the capital — was involved in many other kinds of testing, training, and transport operations, including the transport of mail to Europe using B-24 Liberators. 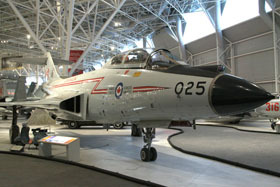 In 1957, the military's main flight testing and development operations moved to RCAF Station Uplands (now located at Ottawa Macdonald-Cartier International Airport). In 1964 the RCAF ceased flying operations at the base, however it saw continued use as an administrative and logistics base. The airfield passed back into civilian control and the Rockcliffe Flying Club began using the field. The airfield is presently and will continue to be operated as Rockcliffe Airport by the Rockcliffe Flying Club. 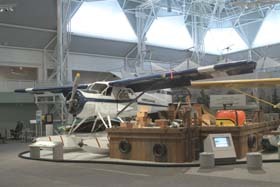 The Canada Aviation Museum is located on the old flight line with the airport also being used for delivering aircraft to the museum's collection. 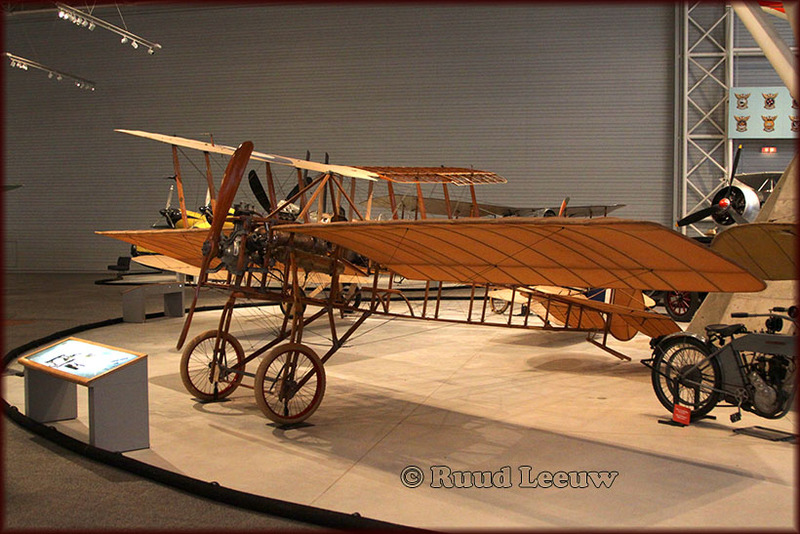 In 1911 and 1912, Belgian pilot Mestach flew one of these on a series of exhibition flights in the US and Canada. He flew over Quebec City, Sherbrooke and Winnipeg. The museum holds 2 reproductions of the Silver Dart, both of which were built at No.6 Repair Depot of the RCAF at Trenton,Ont. 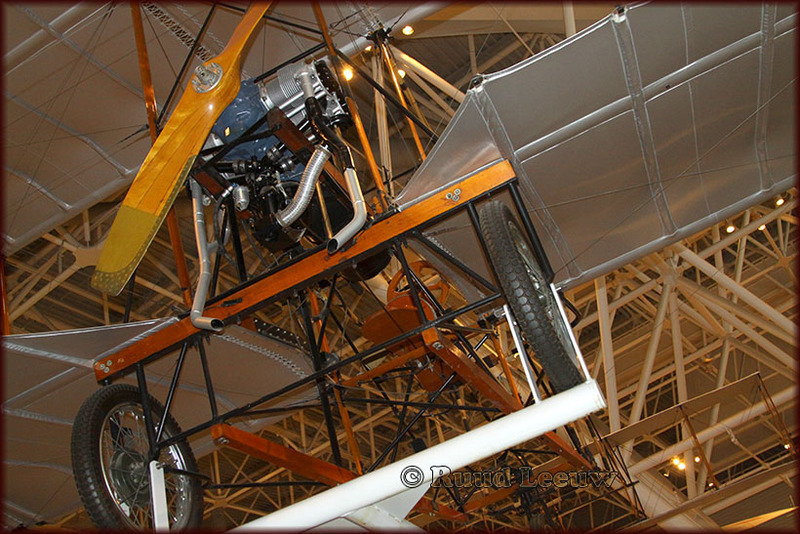 One was constructed with a wooden mock-up of the original Curtiss engine and the other, here on display, is equipped with a modern 65hp Continental engine. 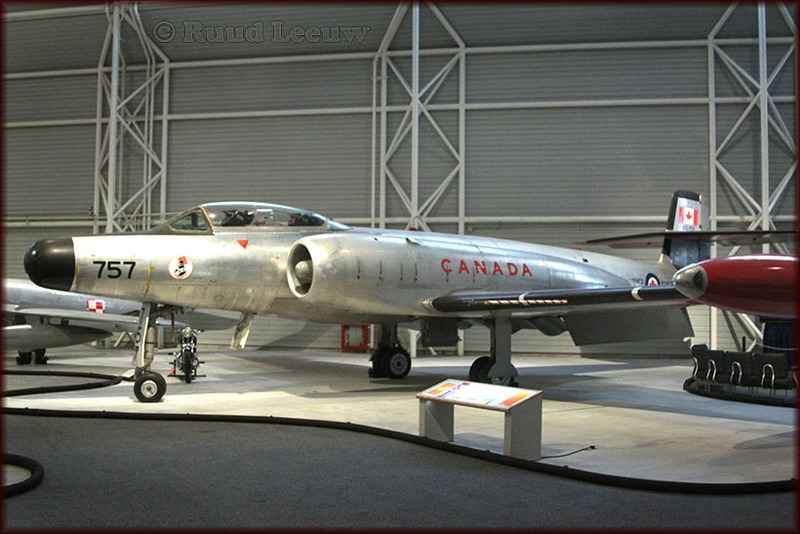 This aircraft was flown at Baddeck on 25Feb1959, to commemorate the 50th anniversary of the Silver Dart's historic 1st flight. Inspired by a visit in 1910 to France and England, Owen McDowall (of Owen Sound,Ont.) constructed this airplane, which was completed in 1915. It was aerodynamically unsound. 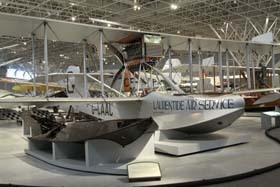 But it is the only Canadian pioneer-era aircraft in existence and as such a fascinating example. 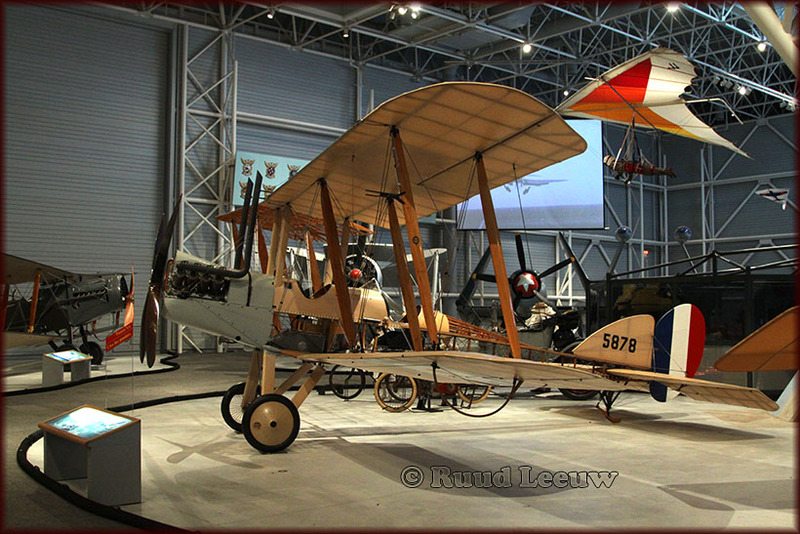 The BE2c was the most numerous and widely used British aircraft of the early W.W. I period. 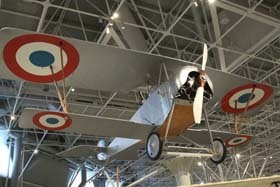 The Museum's example was manufactured in 1916 by the British and Colonial Aircraft Company (later known as the Bristol Aircraft Co.) and served in France during 1916-1917. The Allgemeine Elektrizitäts Gesellschaft (A.E.G.) 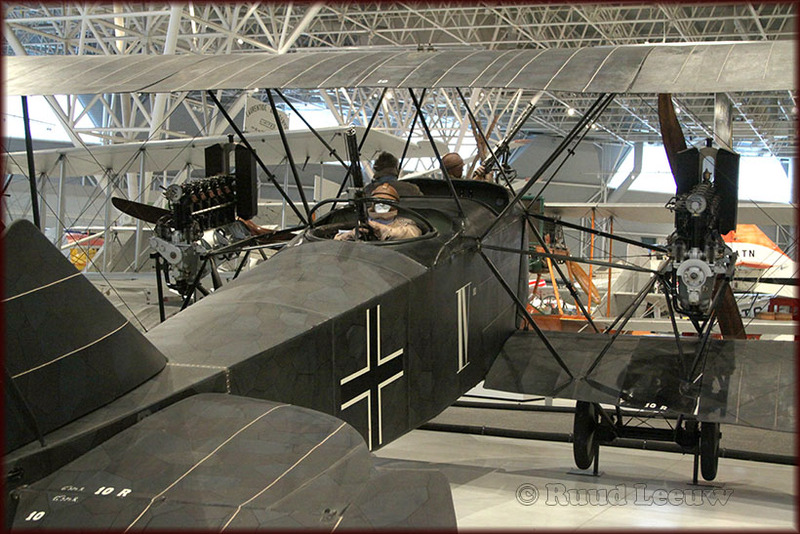 G.IV bomber went into general use with the German Air Force during 1917. Because of its relatively short range, the G.IV served mainly as a tactical bomber, and operated close to the front lines. 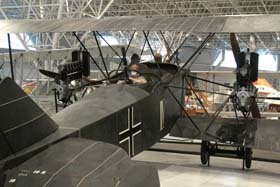 This G.IV is a unique specimen — the only surviving twin-engine German First World War aircraft. It was shipped as a war trophy to Canada in 1919; its movements over the next 40 years (two 260 hp Mercedes engines were lost) were not well documented. The aircraft was stored in a warehouse operated by the Canadian War Museum in the 1950s. The G.IV flew both day and night operations, but, as the war progressed, was restricted increasingly to night missions. 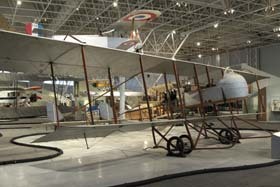 The Curtiss JN-4, manufactured by Canadian Aeroplanes Ktd of Toronto, holds a special place in Canadian aviation history. 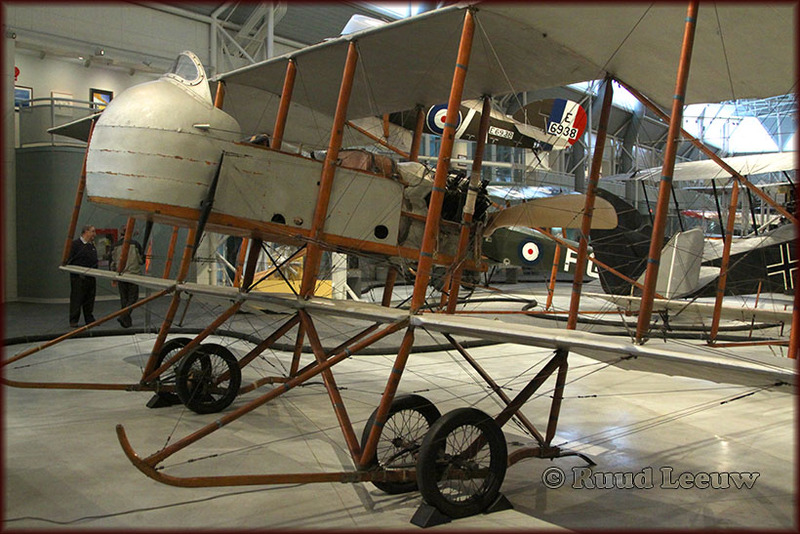 It was put in large scale production for use in the training program newly established by the Royal Flying Corps (Canada) in 1917. 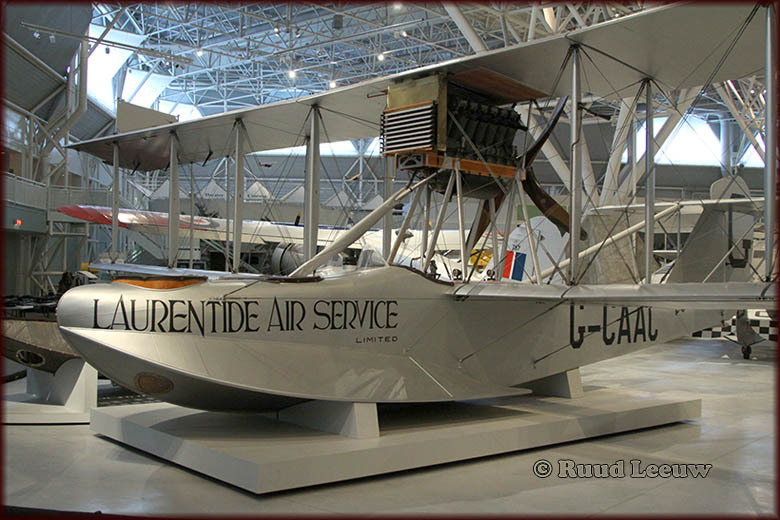 The Canuck was a modified version of the American Curtiss JN-3. 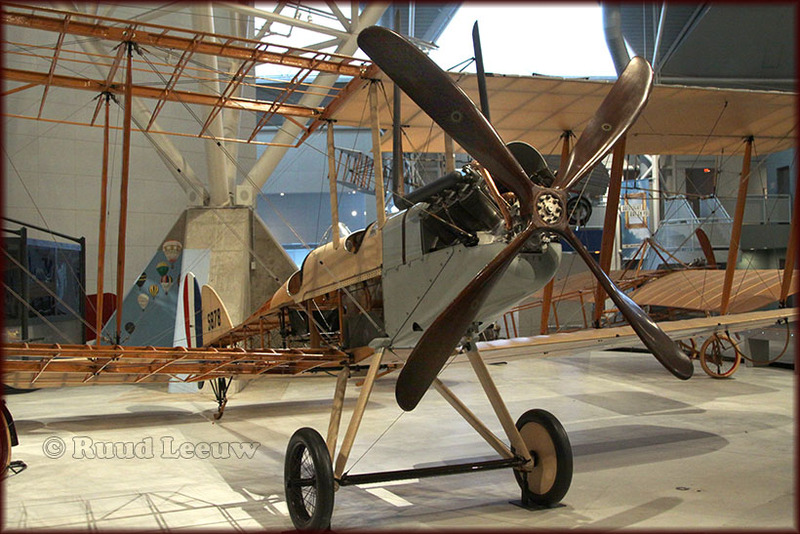 Early in WW1 the Société Anonyme des Établissement Nieuport initiated a wing configuration that characterized almost all of the company's wartime biplanes. Knows as sesquiplanes, these aircraft featured a short and narrow lower wing that had less than half the area of the upper wing. 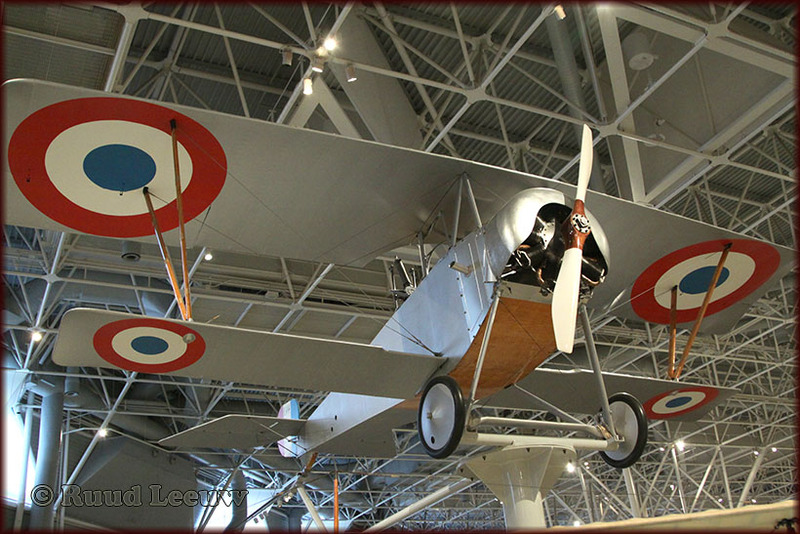 This wing layout improved the observer's view and thus configured, the Nieuport 12's role was reconnaissance. Like many early First World War aircraft, the Shorthorn is a pusher with the engine in the rear of the nacelle . Designed and first flown in France, the Shorthorn was adopted by the air forces of Australia, Belgium, Britain, France, Italy, and Russia. It was manufactured under licence in Britain and Italy. The Shorthorn retired from RAF service in 1918. 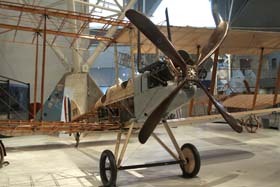 Manufactured by AIRCO for the Royal Flying Corps in 1915-16, this particular specimen (VH-UBC, Australia) is one of four sent to Australia in 1916. In 1919 it was sold as surplus. In storage from the 1930s, this Shorthorn was rebuilt in the 1950s and flown. 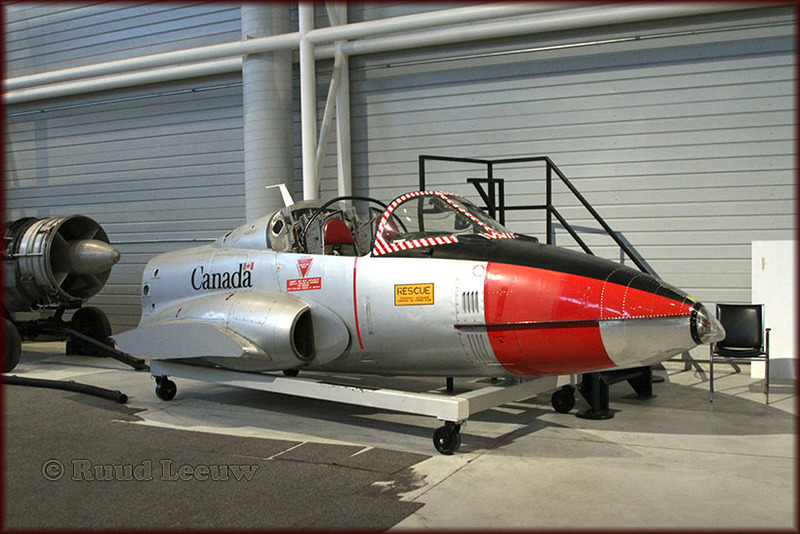 Bought in 1956 by an owner in California, it was later sold to two aviation museums before it was bought at auction in 1981 by the Canada Aviation Museum. 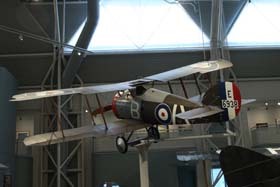 the Snipe, the most powerful and advanced of the British Sopwith rotary-engine fighters, was intended as a replacement for the famous Sopwith Camel. It would undoubtedly have enjoyed the success of the Camel as a fighter but its wartime career was curtailed by the signing of the Armistice. 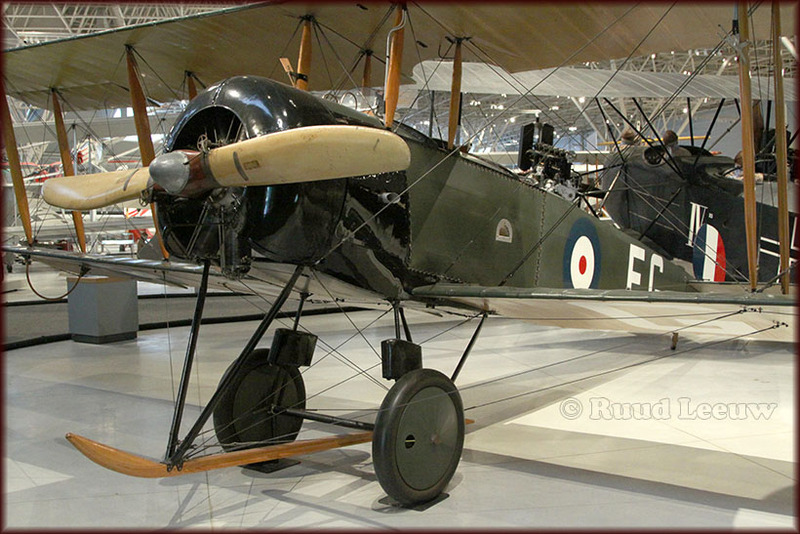 It continued to serve as a fighter with the Royal Air Force (RAF) until 1926. The Canadian ace Major W.G. Barker of Dauphin,Manitoba won his Victoria Cross flying a Snipe in one of the most spectacular air battles of WW 1, fought over Foret de Mormal near Valenciennes. Witnessed by hundreds of ground troops, Barker, badly wounded and against overwhelming odds, managed todown 4 enemy aircraft before crashlanding behind British lines. The fuselage of Barker's VC-winning Snipe is part of the National Aviation Museum's collection and is on display at the Canadian War Museum. 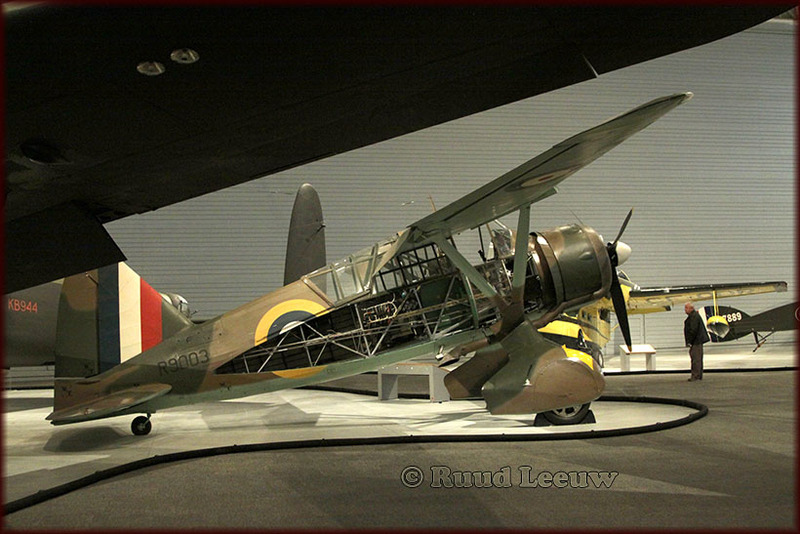 The museum has two Avro 504k's, G-CYCK and G-CYFG; this is probably (G-CY)FG. 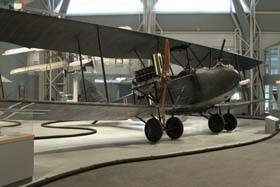 he Avro 504 series was used early in First World War for reconnaissance and anti- Zeppelin patrols, but was subsequently developed as a trainer. A Canadian version was in production just as the war ended, but only two were built. 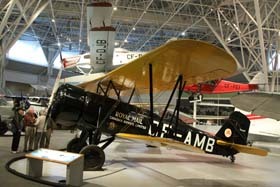 In 1920, the Avro 504K was selected as the standard trainer for the Canadian Air Force and remained in service until 1928 when six were sold for civilian use. 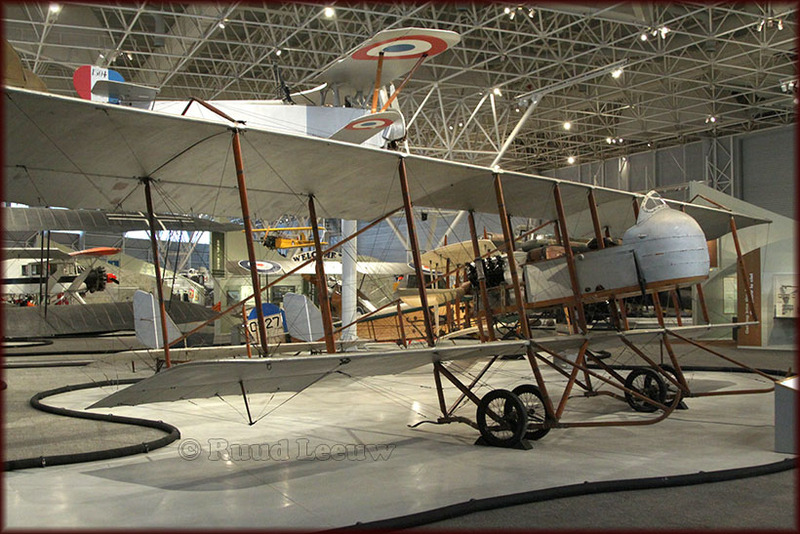 A civil Avro 504K is credited with one of the first commerical passenger flights into the Canadian bush on 15 to 17 October, 1920. Two passengers seated in an enlarged front cockpit were flown from Winnipeg to Le Pas. 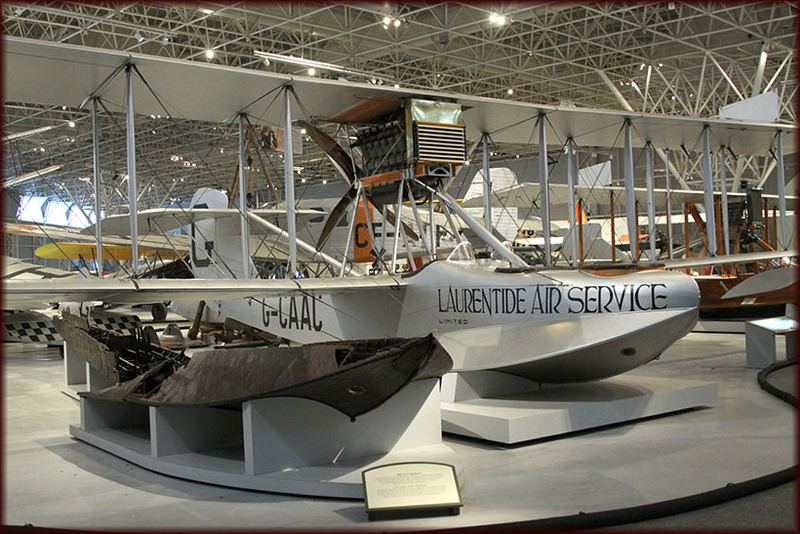 An ex-Air Force 504 made the first winter flight to James Bay in 1922. 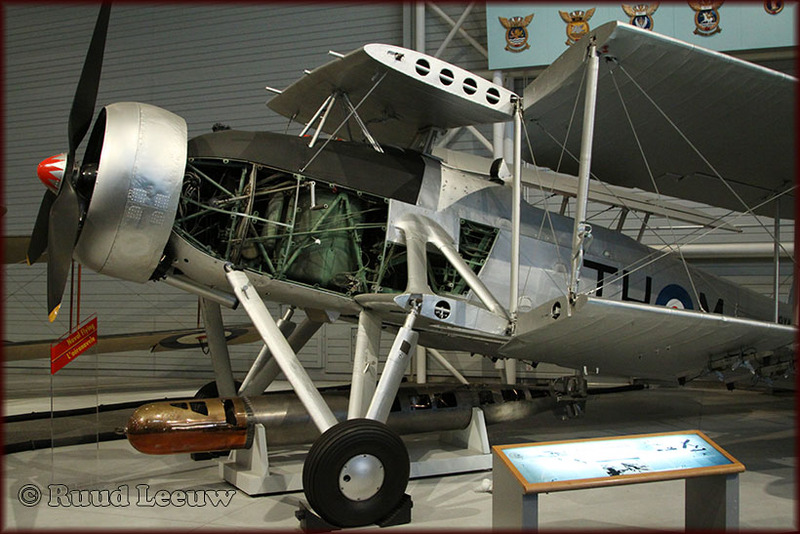 The Swordfish came to be in 1936 but was obsolete by the start of W.W. II. It could carry mines, boms, torpedoes, machine guns but its extreme vulnerability in combat with more modern enemy aircraft exposed its crews to considerable danger. 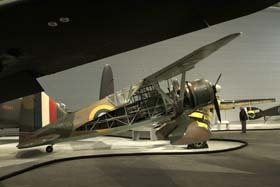 In Canada, Swordfish operations began in 1943 as part of the British Commonwealth Air Training Plan (BCATP) at No.1 Naval Air Gunnery School, Yarmouth, Nova Scotia. A 2nd Group flew from HMS Seaborn, the Royal Naval Station at Darmouth, Nova Scotia. 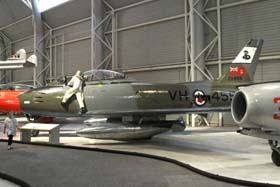 The Hawker Fury was designed as a smaller and lighter version of the Hawker Tempest. The Sea Fury was the naval version, with folding wings and tail-hook. 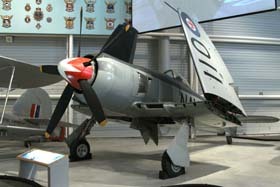 The Sea Fury was one of the fastest piston-engine aircraft built; as a result, some surplus Sea Furies were used successfully for open-class air racing. 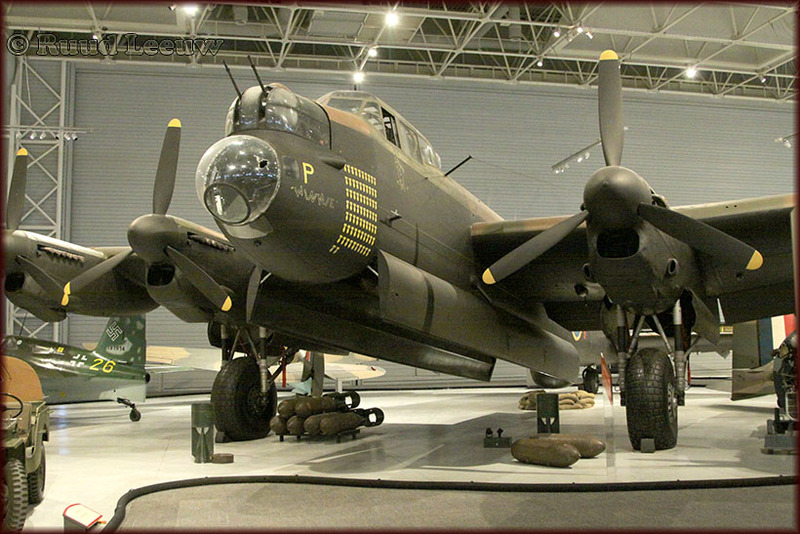 The Lancaster was arguably the best heavy bomber used in Europe in Second World War. Although somewhat vulnerable to fighter attack, it was relatively fast, had a high ceiling, and could carry enormous loads for its size. 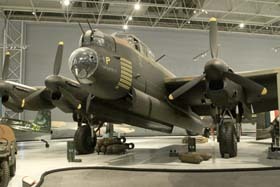 Victory Aircraft at Malton, Ontario, produced the first Canadian-built Lancaster, a Mark X, first flown August 1, 1943. 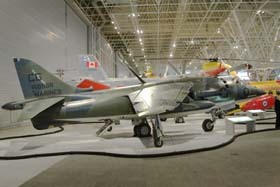 Many Canadian-built Mark Xs served overseas with No.6 Group. nfortunately the specification had been drawn up with W.W. I in mind. 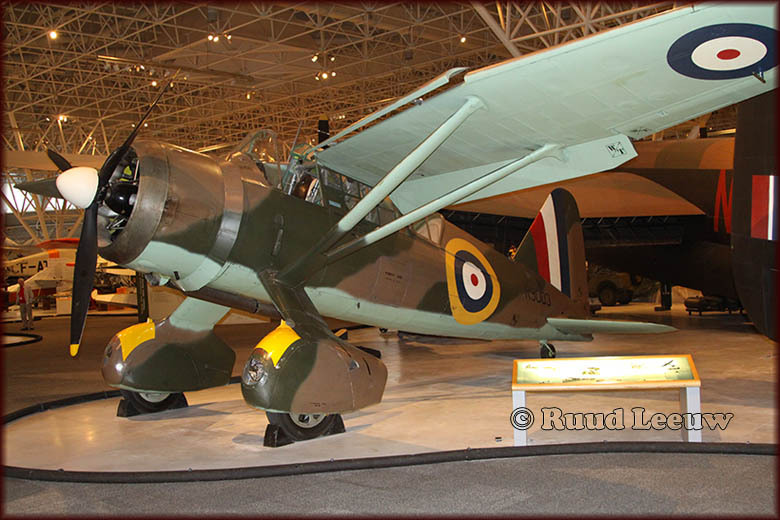 However excellent an airplane, the Lysander proved too vulnerable to survive modern warfare. After 1940, British Lysanders were used for search-and-rescue, and unusual missions such as flying spies in and out of the continent. Canadian-built Lysanders were used chiefly as target tugs at Canadian bombing and gunnery schools. Despite an unspectacular overall performance and a lack of power at altitude, the P-40 was the most important American fighter in the early years of Second World War because it was available in large quantities. P-40s were flown on almost all battle fronts and were supplied to many countries, including Canada, Britain, Australia, New Zealand, China, and Russia. 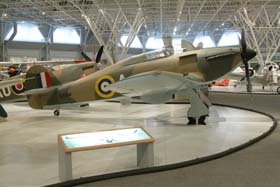 The RCAF operated seven squadrons of Kittyhawks in Canada and Alaska. 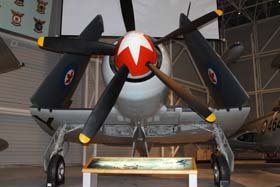 Introduced in 1941, the RCAF retired them all by 1946. A total of 13,750 were built. The best known P-40 unit was the American Volunteer Group in China, the “Flying Tigers”. 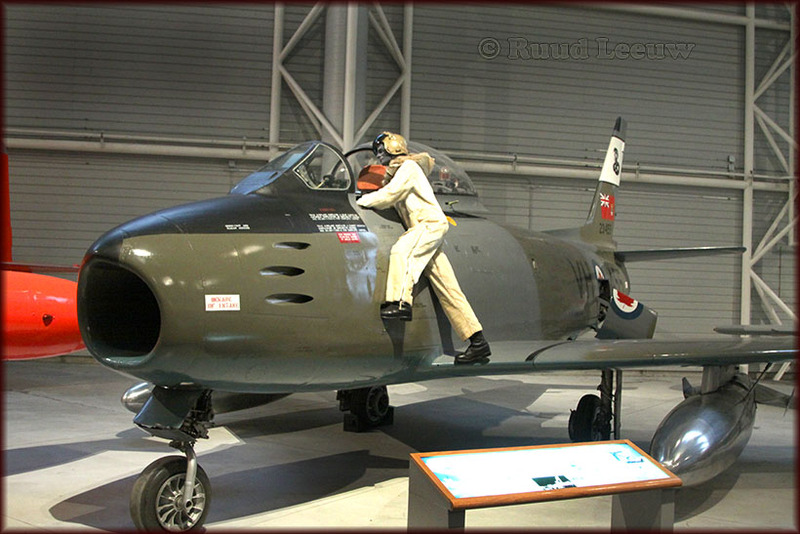 The famous shark-mouth decoration on their aircraft actually originated with the RAF in the Western Desert. 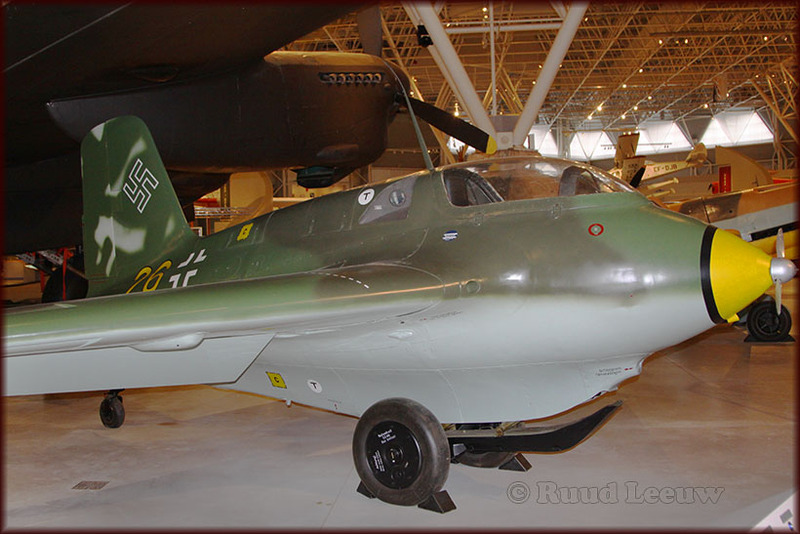 As the only operational rocket-powered fighter of Second World War (first flight: August 1943), the Komet was designed to exceed the performance of conventional aircraft. Originally tested as a glider, the tailless design incorporated a wheeled dolly dropped during takeoff, and a landing skid under the fuselage. The Komet first flew operationally in May 1944. With only 7.5 minutes of full power, the Komet climbed to operational altitude, then glided to a landing after its fuel was exhausted. With power either turned on or off, flight at altitude consisted of gliding interspersed with short bursts of power. 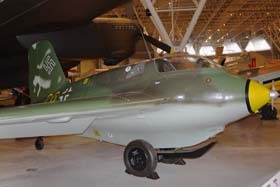 Despite exceptional flying characteristics, the Komet was unsuccessful as an interceptor because of its fast closing speed and slow-firing, short-range cannon. The Me. 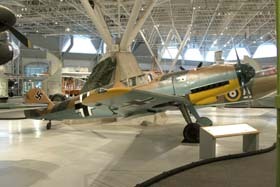 BF109 is one of the greatest fighter aircraft of all time. 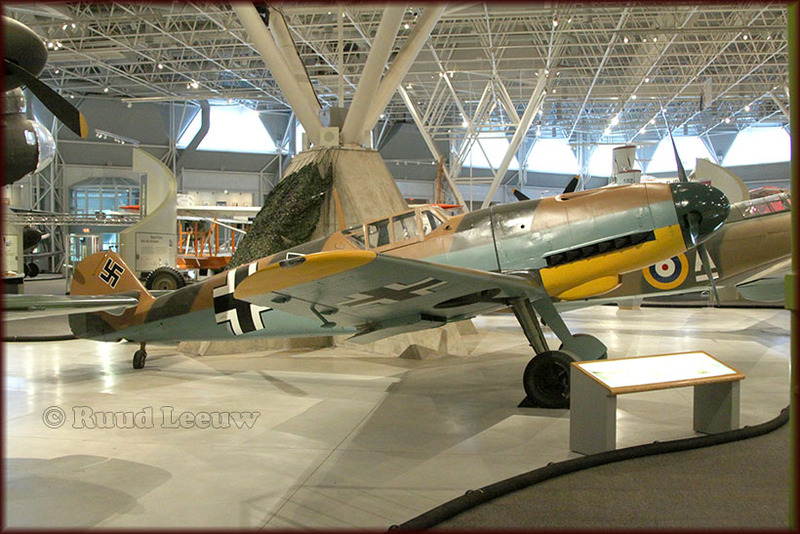 The BF 109 served everywhere the Luftwaffe was engaged and the type was used by a dozen other air forces. Over 33.000 were built. The Hawker Hurricane was the 1st monoplane fighter to enter Royal Air Force (RAF) service, the first capable of exceeding 300mph (483kmh) and the first to carry an 8-gun armament plus the first to feature a fully retractable landinggear. 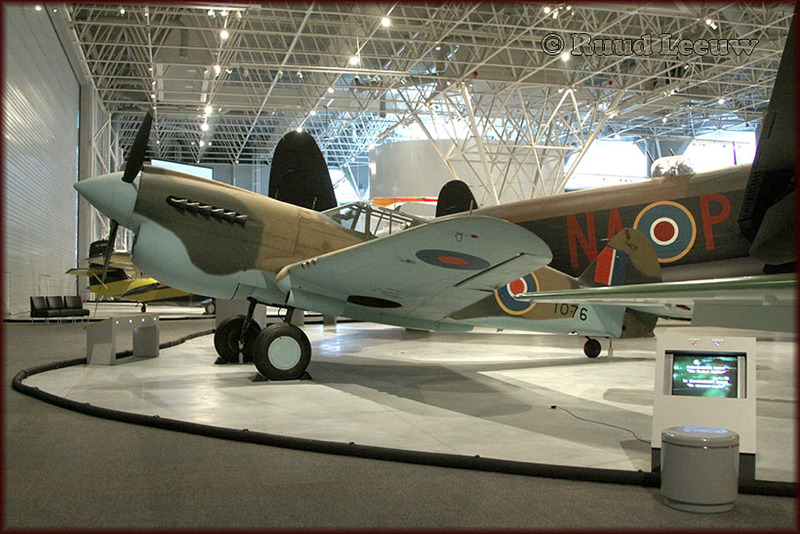 Among the most famous aircraft of all time, the Spitfire began operations before WW2 and was one of the few pre-war types to remain in first-line service until the end of the war and beyond. 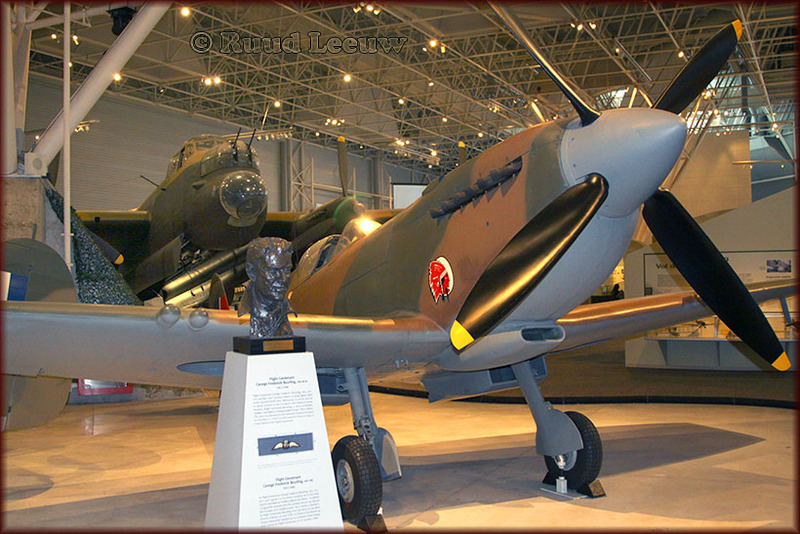 As the war progressed, the Spitfire received heavier armament and more powerful engines until it was twice as heavy and powerful as the original mark. The L.F. Mk. 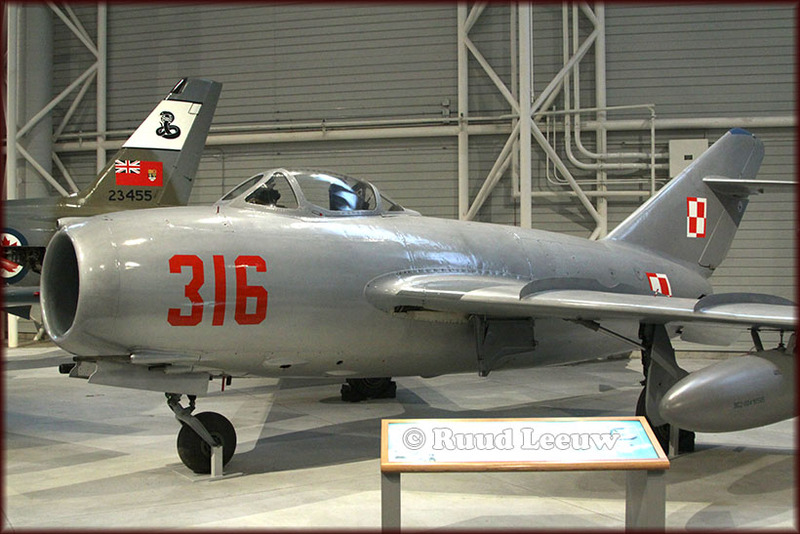 IX ’s lower-altitude capabilities were enhanced by an engine designed to give its best power at a lower altitude and, in some cases, by the removal of the wing tips to increase the speed and rate of roll. 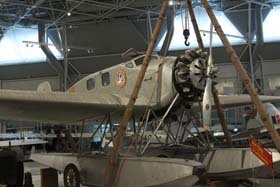 Built in 1944, the Museum’s L.F. Mk. 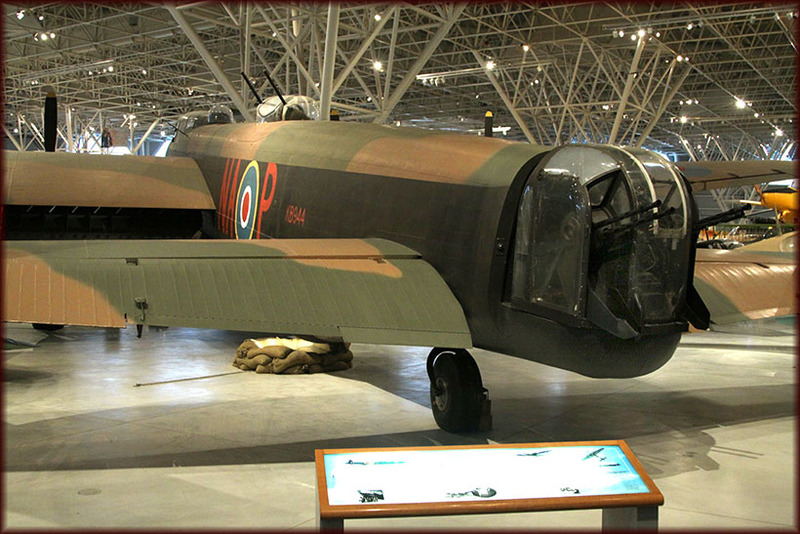 IX flew with the RAF, as well as with one RCAF and one Polish squadron. 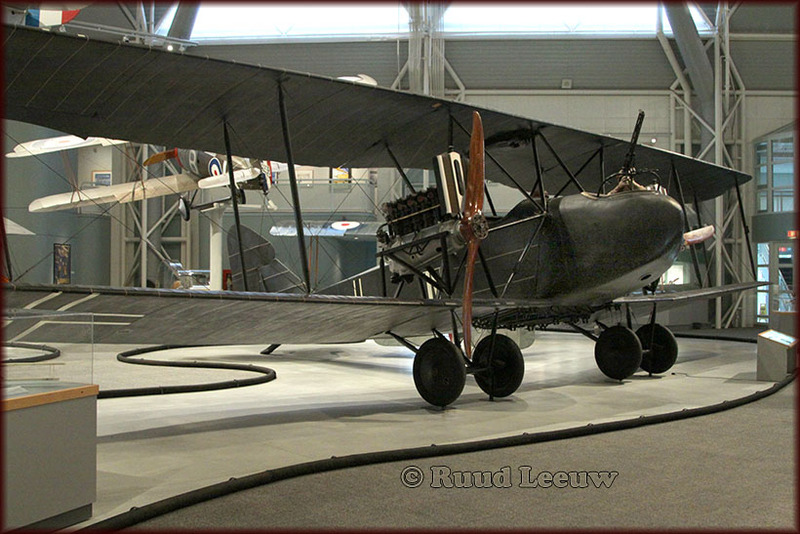 After the war it was sold to the Netherlands Army Air Force and sent to the East Indies. 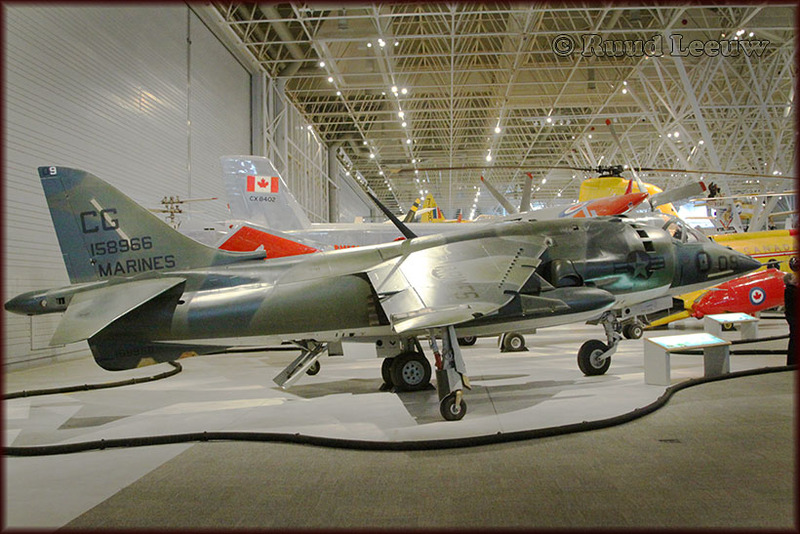 After further service with the Belgian Air Force and private owners, it was purchased and brought to Canada in 1961. 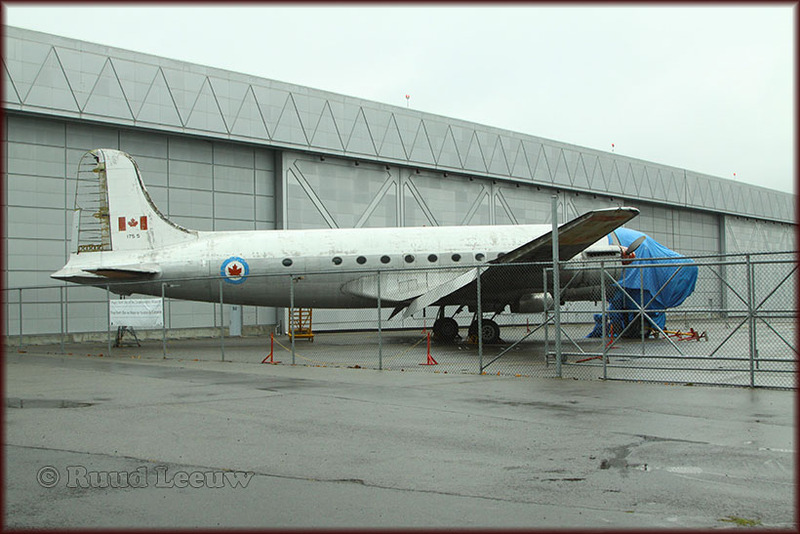 Flown privately from 1962 to 1964, the aircraft was donated by the owner to the Museum. 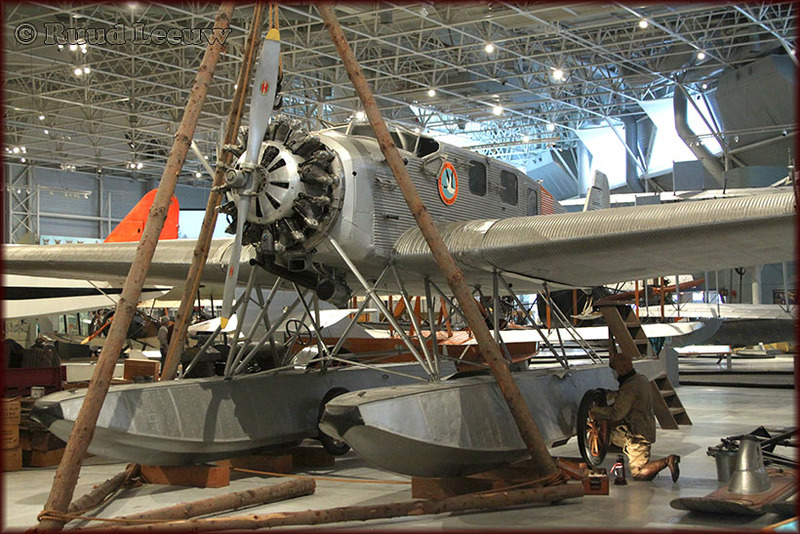 The HS-2L was one of a series of patrol flying boats developed in the last two years of First World War. The United States Navy flew HS-2Ls on anti-submarine patrols from bases in Nova Scotia. 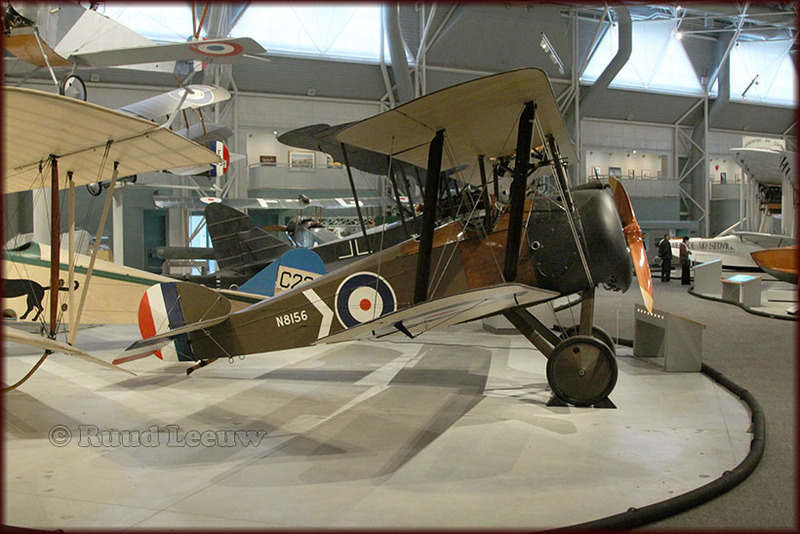 At the end of the war twelve HS-2Ls were donated to Canada, and many others were purchased as war surplus. Shortly before the end of Worl War 1, six HS-3s were built (using HS-2L spare parts), with a modified hull. 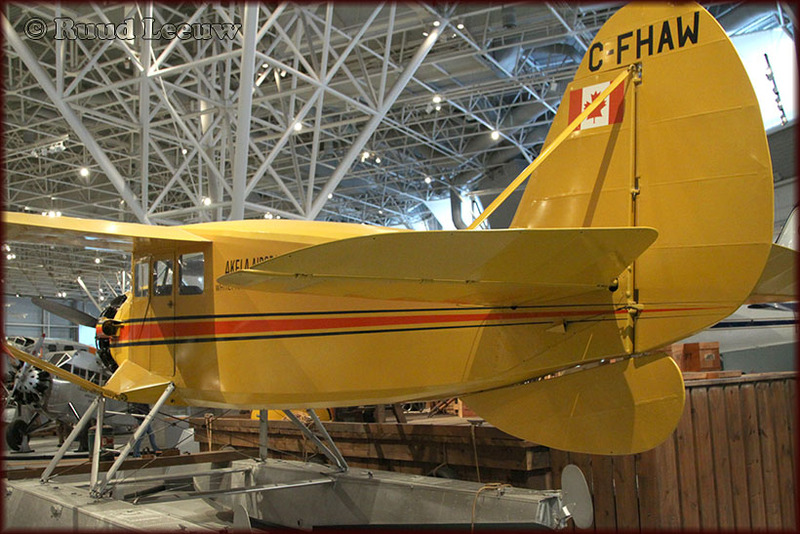 The HS-2L was Canada’s first bush aircraft and was the predominant Canadian bush plane until 1926 or 1927. 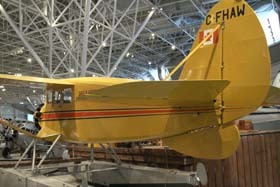 Operators of the HS-2L established the traditions of Canadian bush flying. 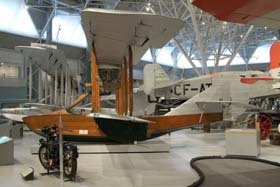 HS-2L aircraft flew the first forestry patrols, made the first aerial timber survey in 1919, staked the first mining claim using an aircraft in 1920, and in 1924 was used to establish the first scheduled air service and the first regular air mail service in Canada. HS-2L G-CAAC, the Museum’s aircraft, performed the first ever "bush flight" in 1919. 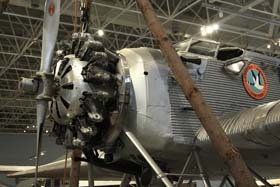 The restored HS-2L on display incorporates parts from three different aircraft. 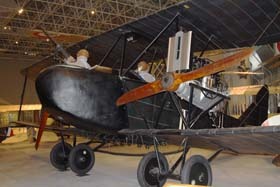 The original aircraft was manufactured in 1918. Operated out of Dartmouth, Nova Scotia, it was presented to the Canadian Government and subsequently loaned to the St. Maurice Fire Protective Association. 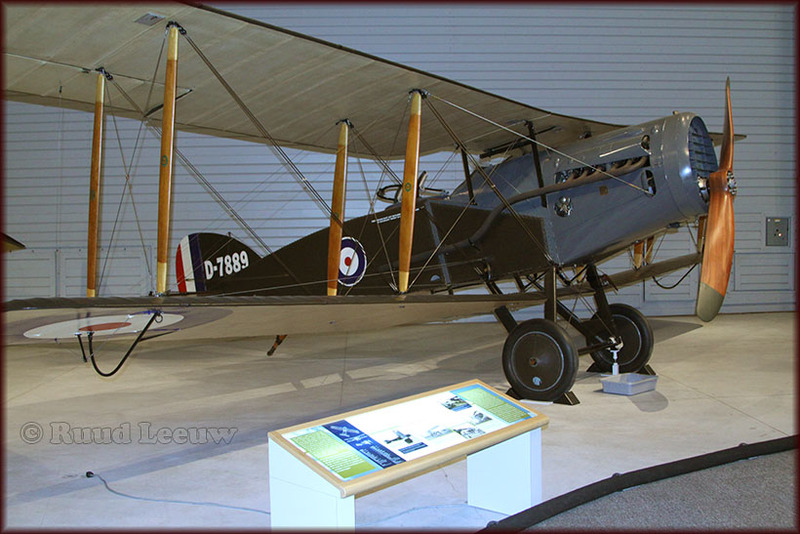 This aircraft performed Canada’s first bush flights in June 1919. 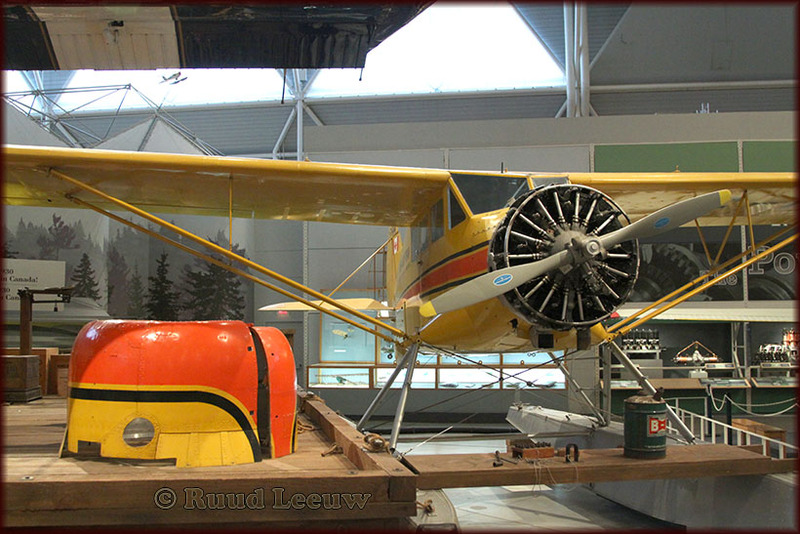 On September 2, 1922, it crashed into Foss Lake, Ontario. 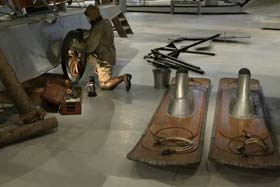 The hull and many parts and fittings were retrieved by the Museum during a salvage operation in 1968-69. 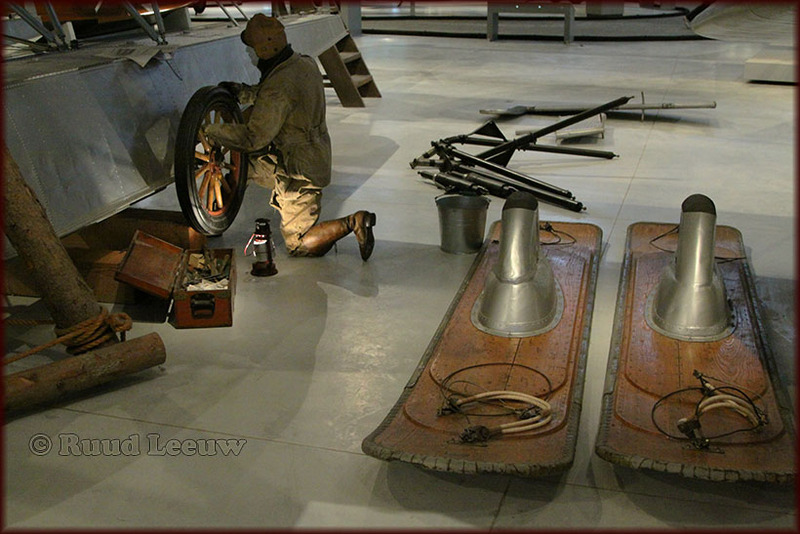 The hull was preserved as recovered, and a new hull was constructed at the Museum. 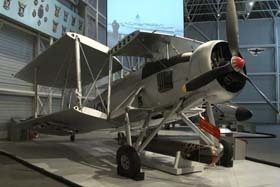 The Curtiss Seagull appeared shortly after the end of World War I. Although it was probably the best small flying boat of the period, not many were sold. The Seagull had to compete with the low-priced, war-surplus Curtiss MF flying boats from which it had been developed. 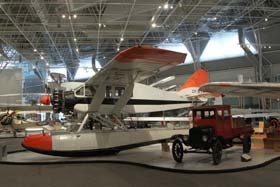 With its wooden hull, pusher engine, and fabric-covered wings, the Seagull was typical of the flying boats of the period. 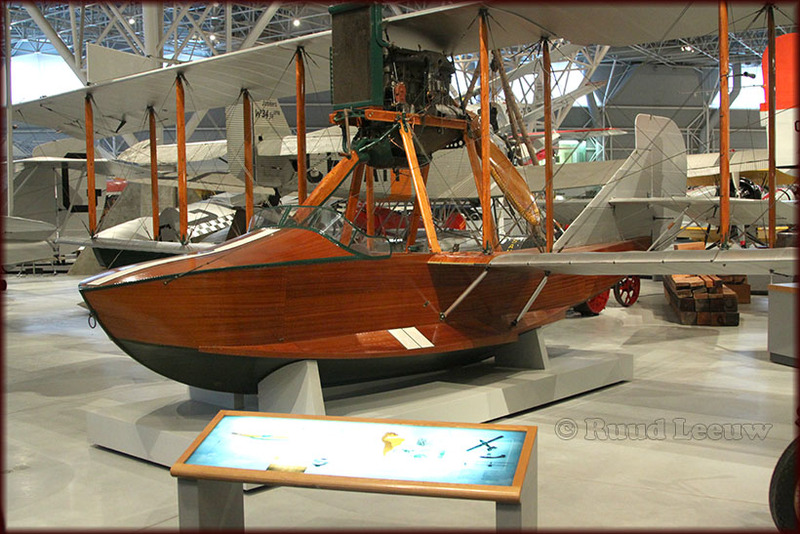 The hull was constructed of mahogany plywood veneer over a wood frame and could accommodate three people. The Museum example was the first aircraft to explore the upper Amazon Valley in Brazil. During 1924-25, it conducted an aerial survey of the Parima River headwaters. It was donated to the South Kensington Science Museum in London, where it was slightly damaged in a bombing raid in 1941. 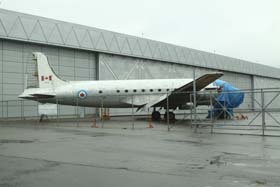 Initially on loan, it finally came into the Museum’s collection in 1968 in exchange for a Douglas Dakota nose-section. The Seagull was restored by the Museum. 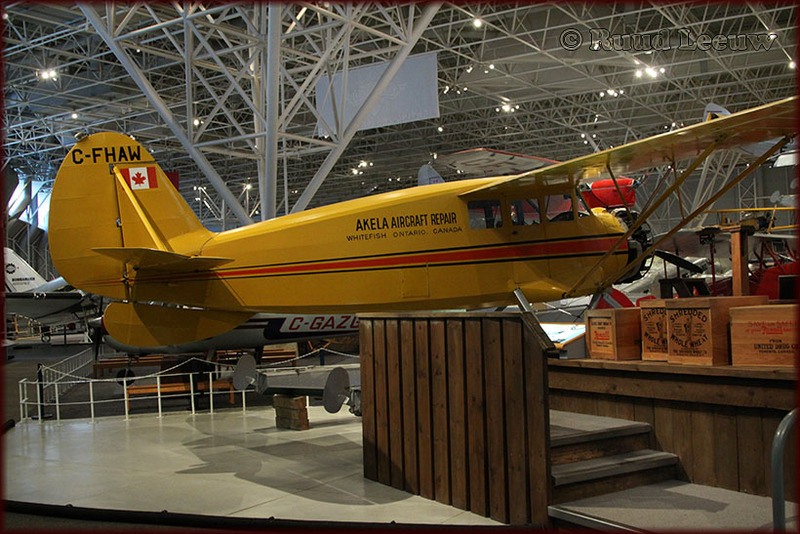 Bellanca Pacemakers were renowned for their reliability and weight-lifting attributes, which contributed to their successful operation in the Canadian bush. 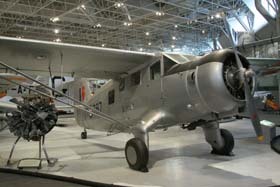 Canadian-operated Bellancas were initially imported from the United States, but later 6 were built by Canadian Vickers in Montreal and delivered to the RCAF, which used them mainly for aerial photography. 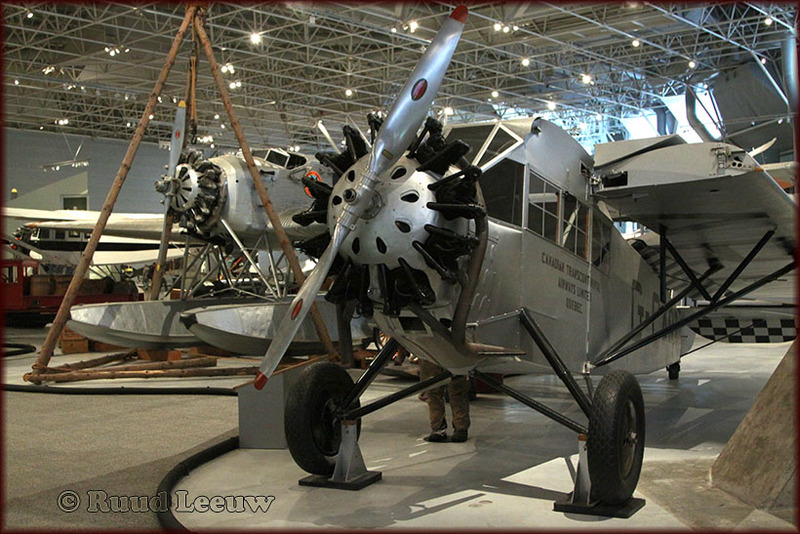 Charles Lindbergh commissioned the Spirit of St. Louis only when he failed to acquire the second prototype Bellanca WB-2... 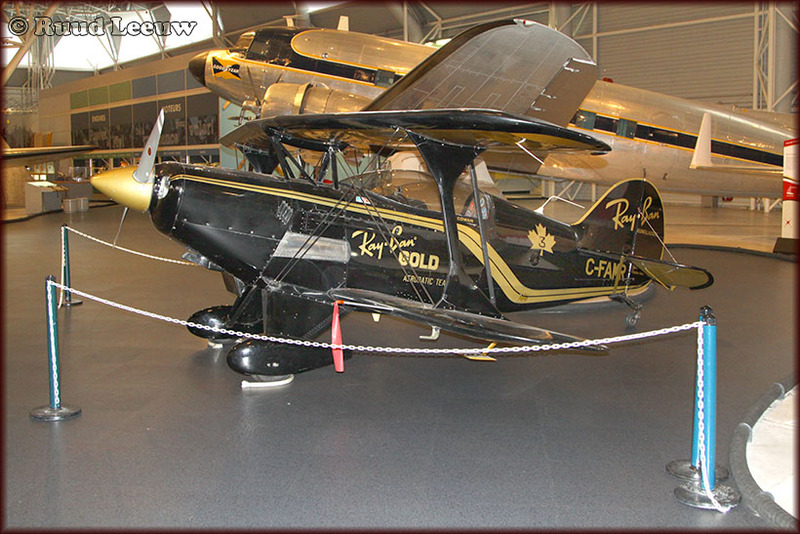 This Bellanca, named Columbia, flew from New York to Germany only 2 weeks after Lindbergh’s famous flight. 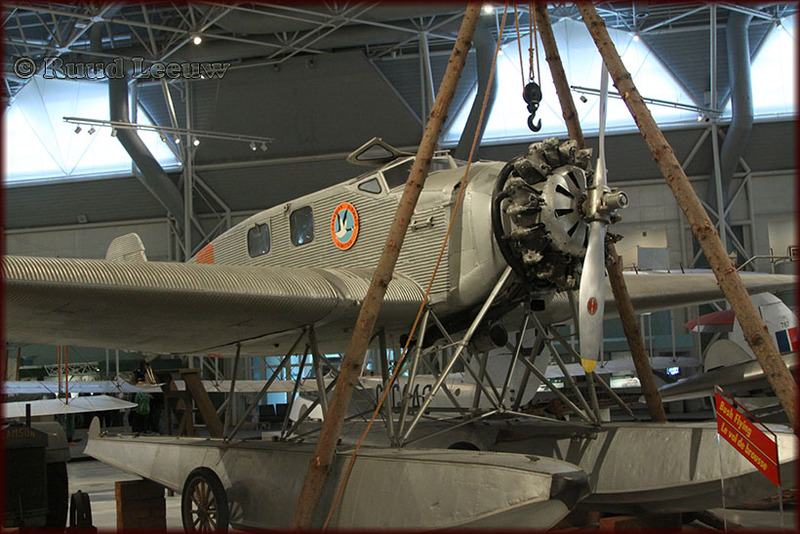 In 1931, a diesel-powered Bellanca set an unrefuelled endurance record of 84 hours and 33 minutes! CF-ATN (c/n 181) is the only known remaining Pacemaker. 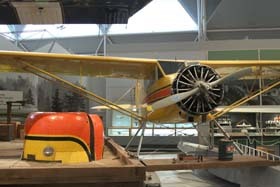 It operated commercially in Alaska and the lower 48 states from 1929 until 1964, when it was purchased and flown to the Museum. The Junkers W34 continued the line of all-metal Junkers aircraft going back to the Junkers J I. 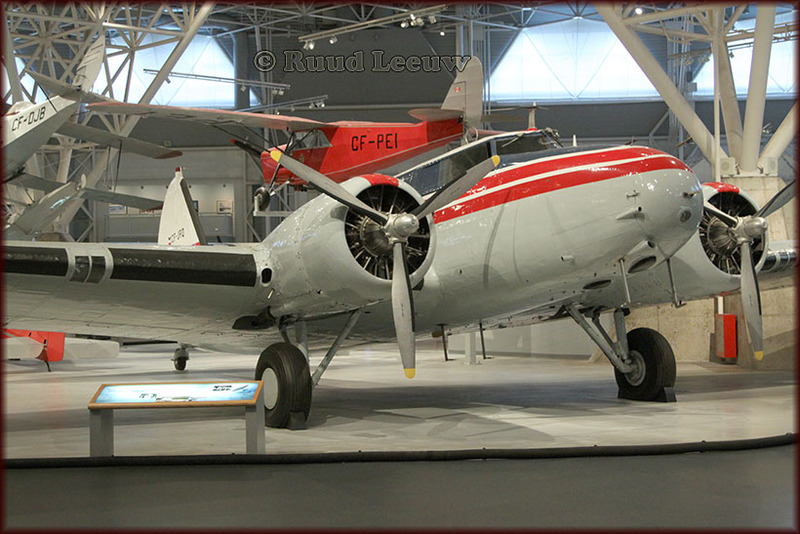 Only 9 Junkers W34 were imported to Canada, due to the high cost of its metal construction and the heavy tariff imposed on German aircraft. Canadian Airways was the primary Canadian operator. A Junkers W33, with a water-cooled engine, flew the first east-west trans-Atlantic flight in 1928. It landed on Greenly Island in Labrador after a 37-hour flight. The W34 was widely exported and up to the end of World War II was the German Air Force’s standard instrument and navigation trainer. With its good flying characteristics and rugged construction, the Junkers W34 was considered by many to be the best bush plane of the 1930s and early 1940s. 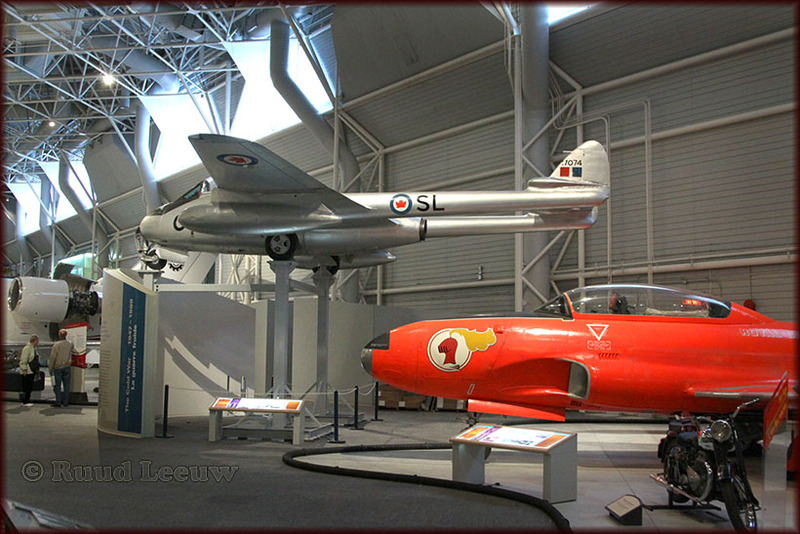 The Museum example was still flying up until its donation to the Museum in 1960. 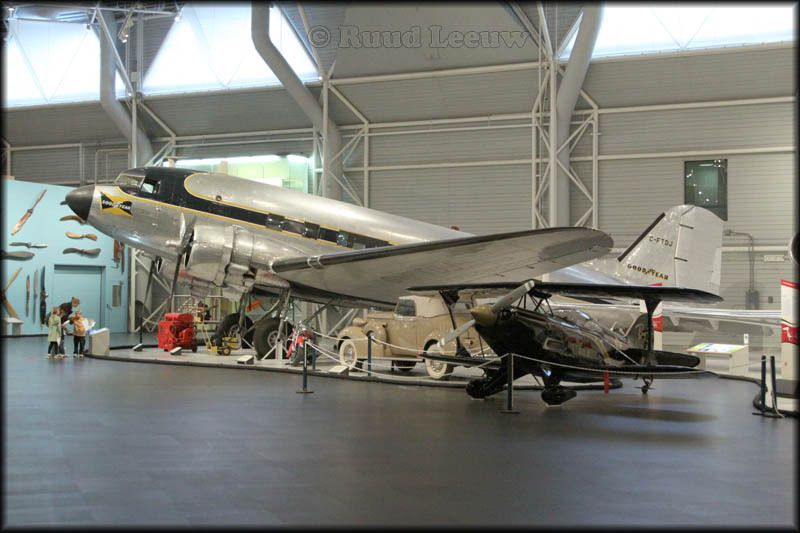 The handover ceremony in 1962 was the last flight of any of the Junkers F13/W33/W34 family of aircraft. CF-ATF, with construction number 2718 and year of manufature 1931, had been and and operated by various Canadian operators until 1960, when it entered storage. 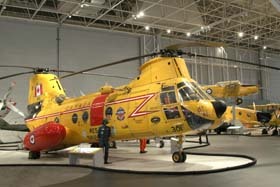 And in 1962 CF-ATF was flown from Kamloops,BC to the museum. Unable to find a suitable aircraft for their aerial-survey business, Fairchild designed a tough, simple aircraft of their own, the Model FC-1, which was shortly improved upon by the FC-2 and subsequent versions. 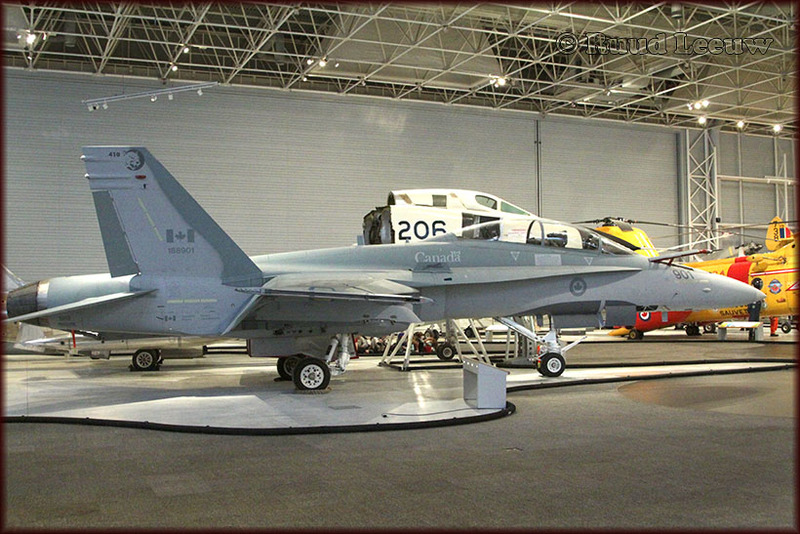 Created to operate in remote areas, this aircraft series suited the Canadian environment. 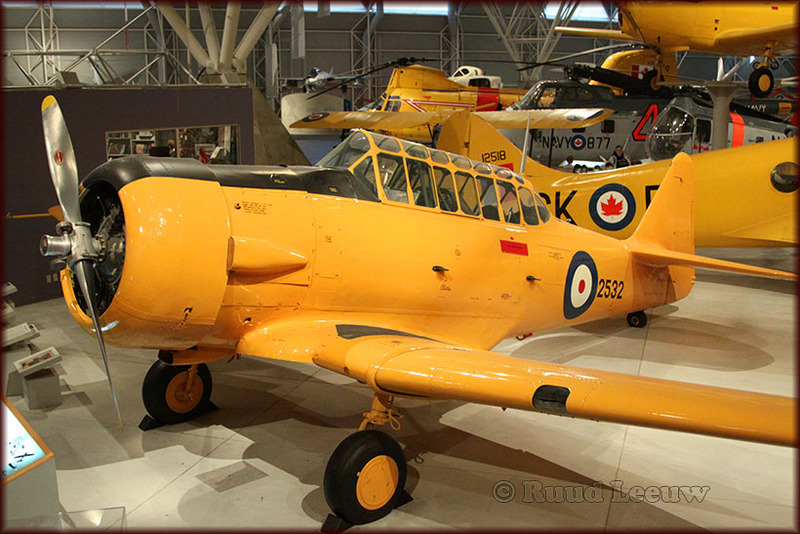 The RCAF used Fairchilds chiefly for photographic surveys and communication. Civil use in Canada involved largely freight and passengers in the north, and passengers in the south. 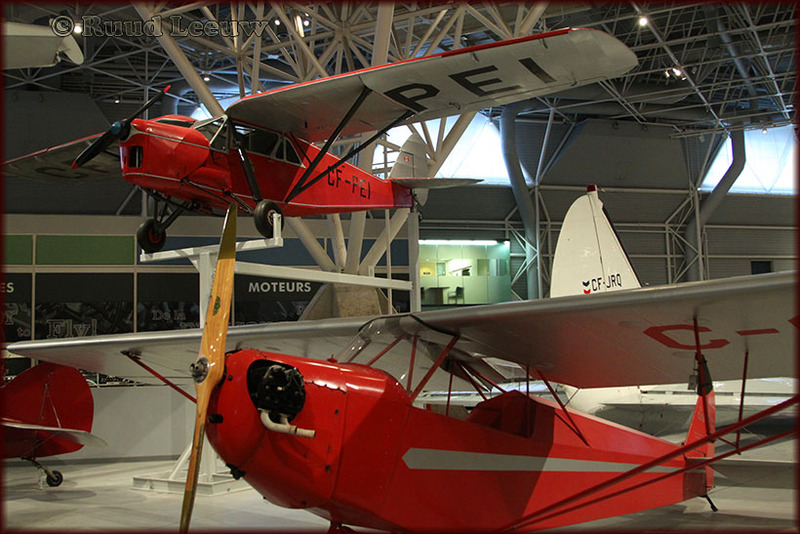 Much of the work to open up Canada's north in the 1920s and 1930s was performed by Fairchild FC-2s, 2Ws, and 2W-2s. 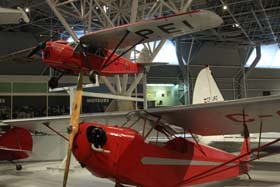 FC-2W-2s flew Canada’s first international passenger service between Montreal and New York. 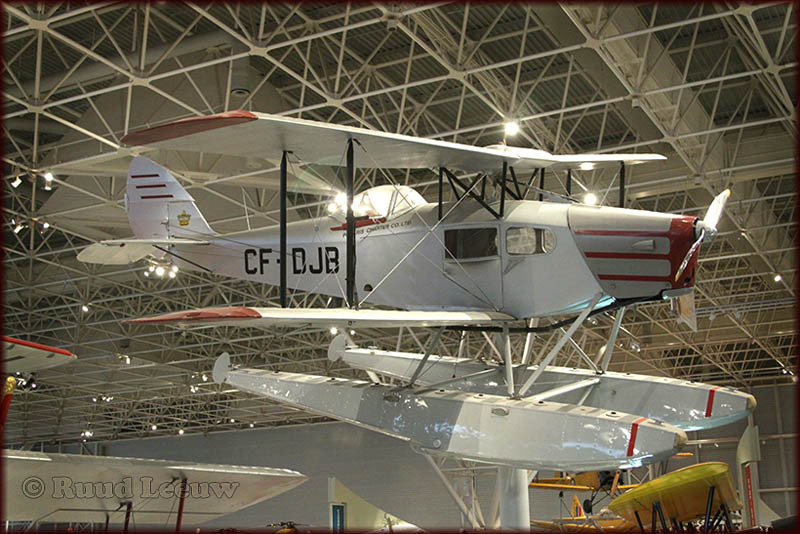 In 1928, 2 Canadian FC-2W-2s were the first to reach the Junkers W.33 Bremen, which had crashed in the Strait of Belle Isle after the first east-to-west trans-Atlantic flight. 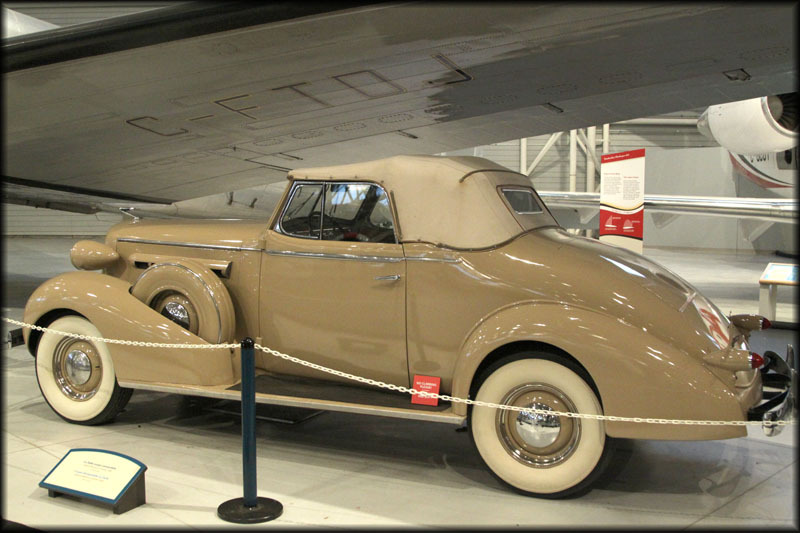 The Fairchild’s wings fold back for convenient storage, which meant that in the Arctic the airplane could be put undercover with a small snowfence and a tarpaulin. Manufactured in 1928, this FC-2W-2 was employed in survey work until the 1940s. It was sold to an aircraft broker, but was damaged in a crash. 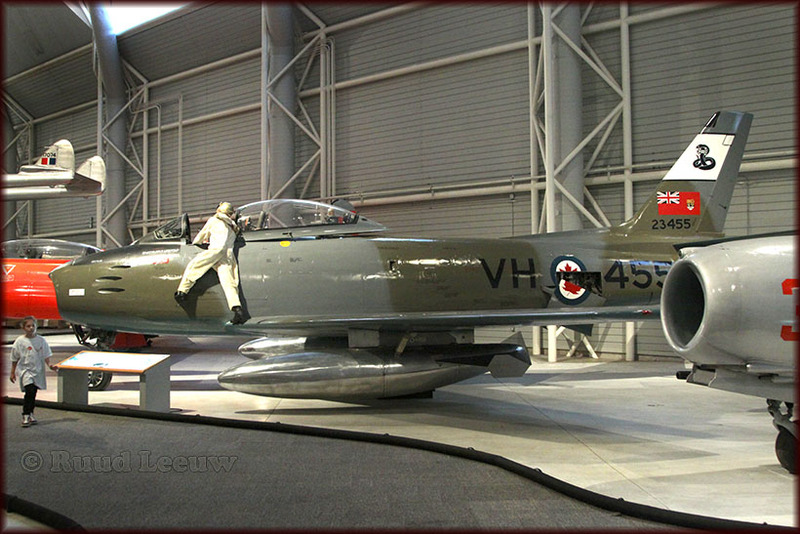 The aircraft was donated to the Museum in 1962. 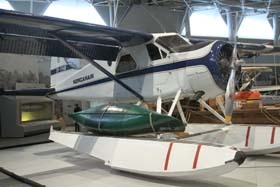 The DHC-2 Beaver was designed and built in response to the demands of Canadian bush operators. With its all-metal construction, high-lift wing, and flap configuration, the Beaver was a robust aircraft with excellent short take-off-and-landing capability even with heavy loads. In addition to its success in Canada, the Beaver found acceptance in as many as 60 other countries all over the world. Although not ordered by the RCAF, some 980 served with distinction in the US Army and US Air Force. About 1600 were made. The Museum example is the prototype — the very first Beaver — and was still being flown by a northern operator when purchased by the Museum in 1980. The DHC-2 Beaver was such a success that more were built than any other aircraft designed and manufactured in Canada. In 1951 it won both the US Air Force and US Army competitions for a utility aircraft. Many were used in Korea, where it was known as the “general’s jeep”. 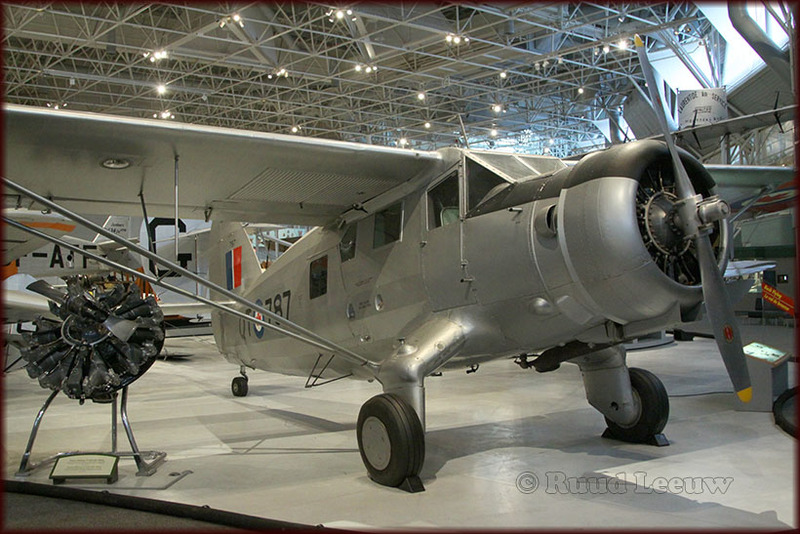 The Norseman I was designed to fit requirements identified by Canadian pilots and operators. Early Norseman aircraft were underpowered, but with a more powerful engine and a few modifications, the Mk.IV reached its full potential. Mk.IVs and VIs flew in the RCAF. The US Army Air Forces ordered VIs in quantity. The V produced after the war was the last civil version. When production ended in 1959, 904 Norsemans had been built. Some were still operating commercially in the early 1990s. 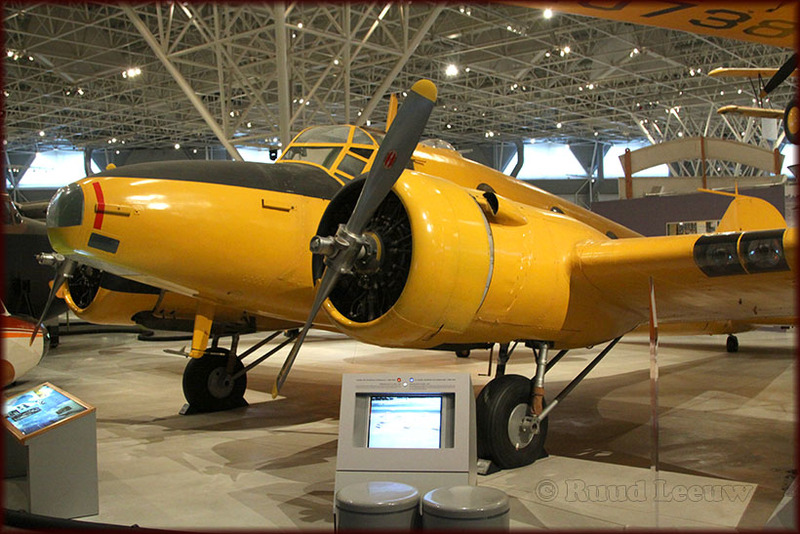 This Norseman (c/n 136) was built in 1943 as the first RCAF Norseman VI. 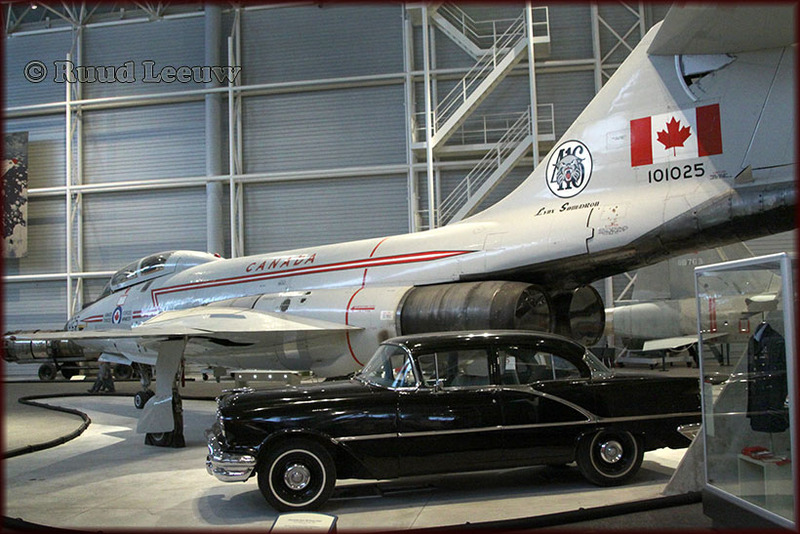 After RCAF service and storage until 1962, it was transferred to the National Aeronautical Collection in 1964. 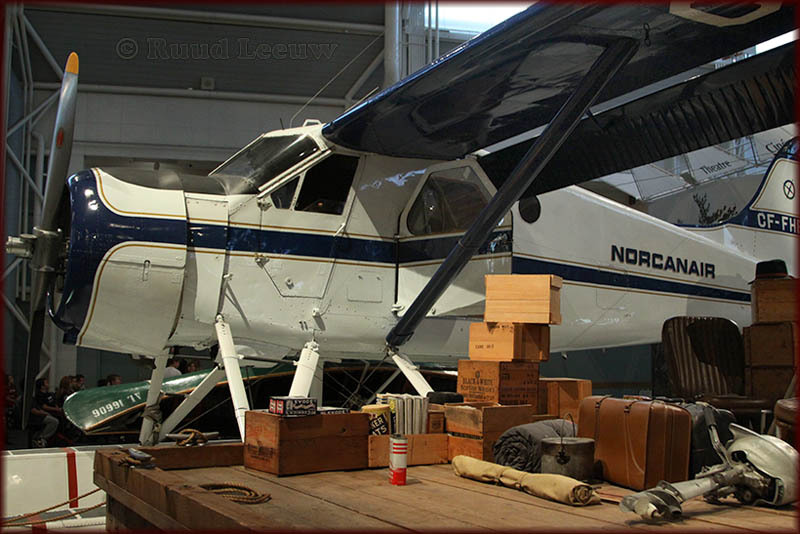 The Norseman was rugged and reliable with a large cargo area. The cargo door could accommodate a standard 45-gallon fuel drum, an essential item in all northern operations. 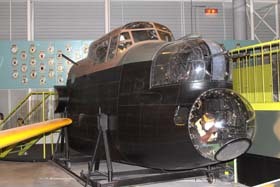 It also had separate cockpit and fuselage doors so that the pilots could get in and out without disturbing passengers or cargo. 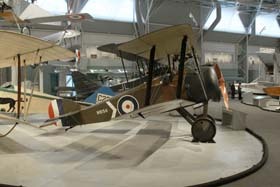 The designation 'Norseman V' was reserved by the company until the end of the war to represent the Winston Churchill’s "V for Victory" symbol. 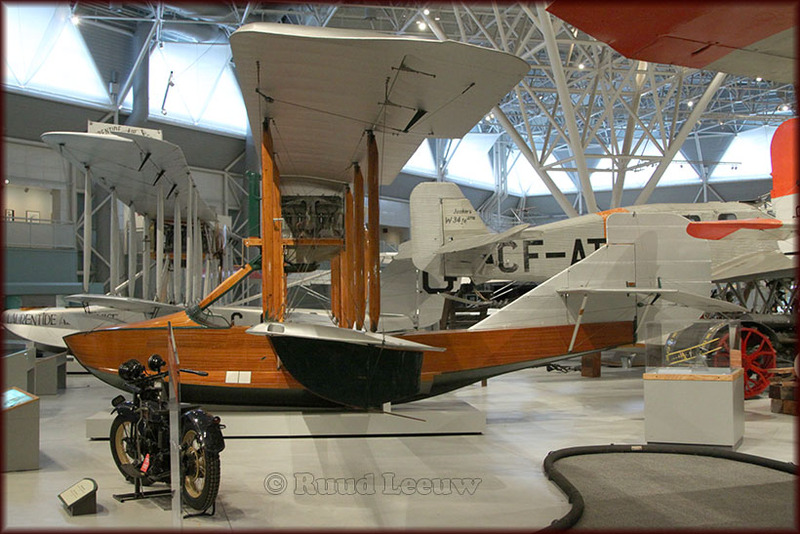 Showing one side of the versatile Norseman is this article SURVEY FLYING IN CANADA by Lt-Gen Bill Carr (CMM DFC CD), published in the March 2007 issue of Aeroplane Monthly. 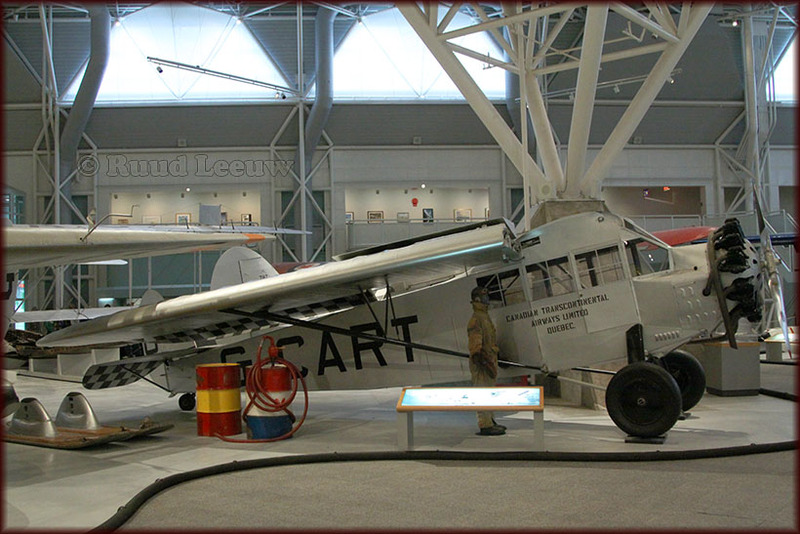 The Museum's Stinson SR-10 Reliant was built in 1933 and its first owner was the well known William Lear of Learjet fame. 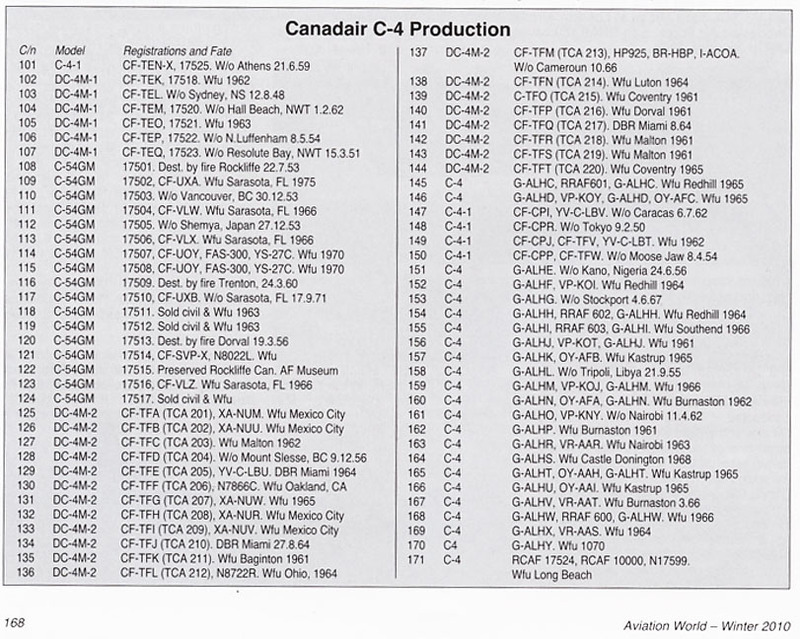 After passing through the hands of several private and commercial operators in the United States, CF-HAW was registered in Canada in 1953. It continued to fly commercially until purchased by the Museum in 1983. Stinson SR-10J Reliant, CF-HAW (c/n 8717). The Stinson Reliant SR was designed for private operators and small charter companies. 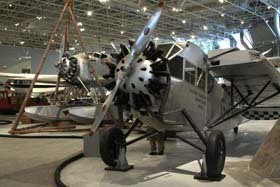 Although it was the type of airplane suited to Canadian bush operations, only one was imported before Second World War. A second Reliant entered Canada in 1953. This airplane was not retired until 1973. About 190 Reliant SRs were produced. 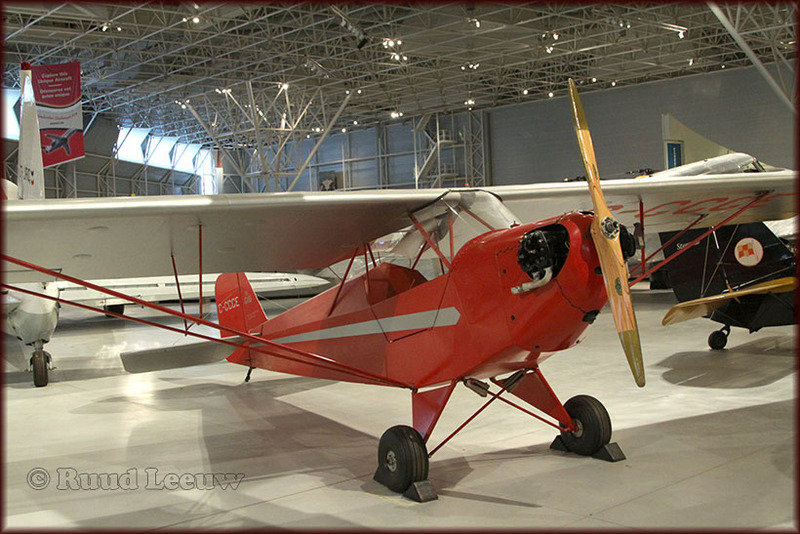 The Stinson Reliant SR was also produced in improved models, SR-1 through SR-6 which, though still called Reliant, had a different wing design from the SR. Development culminated in the classic SR-9F 'Gull Wing', many of which flew in Canada. The Fox Moth was designed in England in 1932 as a light, economic transport, and was built using as many Tiger Moth components as possible. 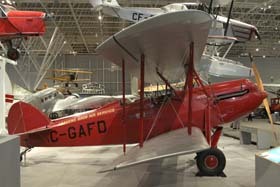 Fox Moths were produced in Canada after the Second World War mainly to keep the plant in production, but also to satisfy the increasing need for new bush aircraft. All the Canadian modifications made to the Tiger Moth were also applied to the Fox Moth. Of the 53 produced, 39 remained in Canada, most of which were operated in float/ski configuration, and gave years of satisfactory service. The Fox Moth, though efficient, was a bit of an anachronism. 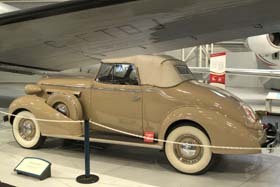 For example, a modern, moulded- plexiglas sliding cockpit-hood was attached to what was essentially a 1932 aircraft. Communication between the passenger cabin in the fuselage and the cockpit to the rear was through a hole in the instrument panel. De Havilland designed a special stretcher for the Fox Moth, in order that it could operate as an air ambulance. The Museum aircraft was built in 1947. 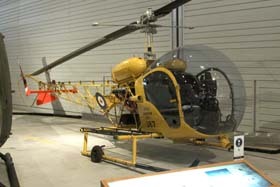 It was owned by a number of operators, then purchased, restored, and flown for Maxwell W. Ward (Wardair) in the 1980s. This Fox Moth was presented to the Museum in 1989. 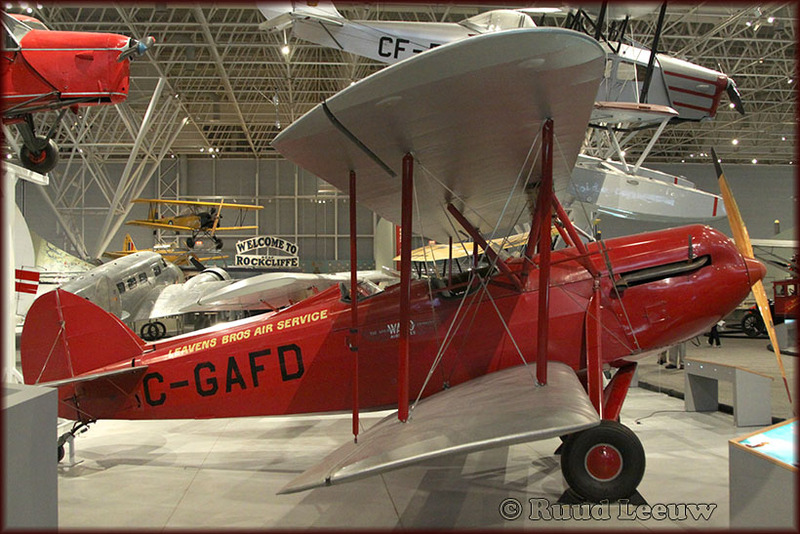 C-GAFD was built in 1928 and was purchased in the US by Leavens Aviation Incorporated during the 1970s and restored to commemorate the firm’s 50th anniversary. It became a familiar sight at aerial displays and fly-ins throughout Ontario for a number of years. At first loaned and then donated by the Leavens family of Toronto, it was flown to the Museum during the summer of 2000. 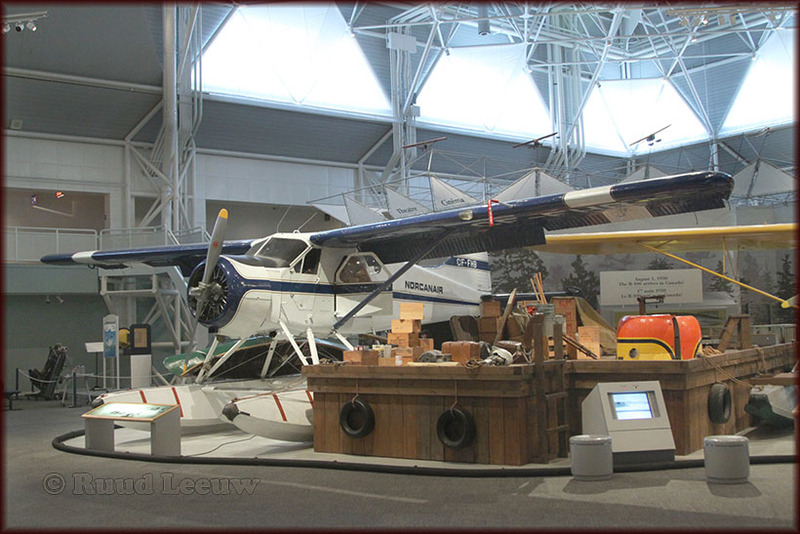 The success of the Aeronca C-2 prompted the Taylor Aircraft Company to introduce a new light airplane design, the E-2 Cub. The company became the Piper Aircraft Company in 1937. The Cub proved popular for both private flying and instruction. Just under 350 were made when production ceased in 1936. 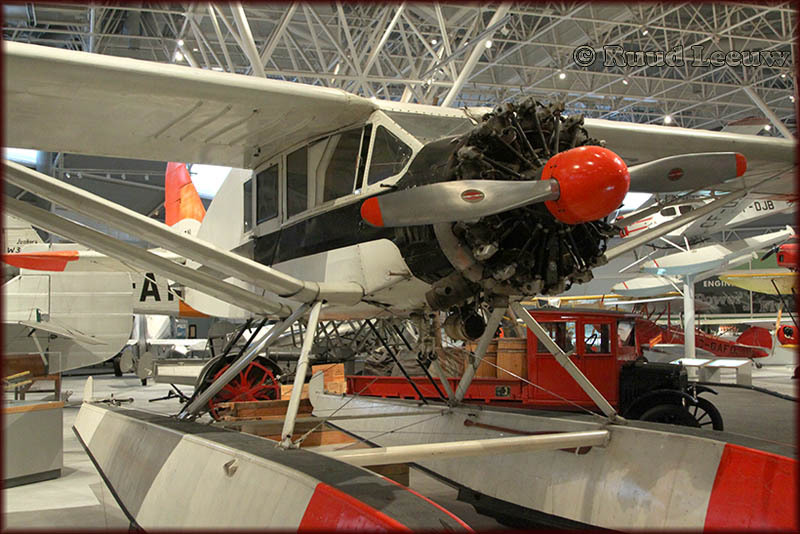 The E-2 led to an improved version, the Taylor J-2 Cub, in 1935, and to the famous Piper J-3 Cub in 1937. 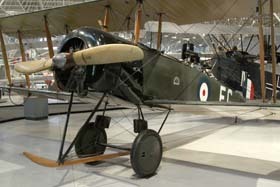 The D.H. 80 and 80A were developed as cabin monoplanes to provide more comfort than was possible in open cockpits with heavy clothing. Popular with the general flying public, Puss Moths were bought by private owners and commercial operators alike. Australian H.J. 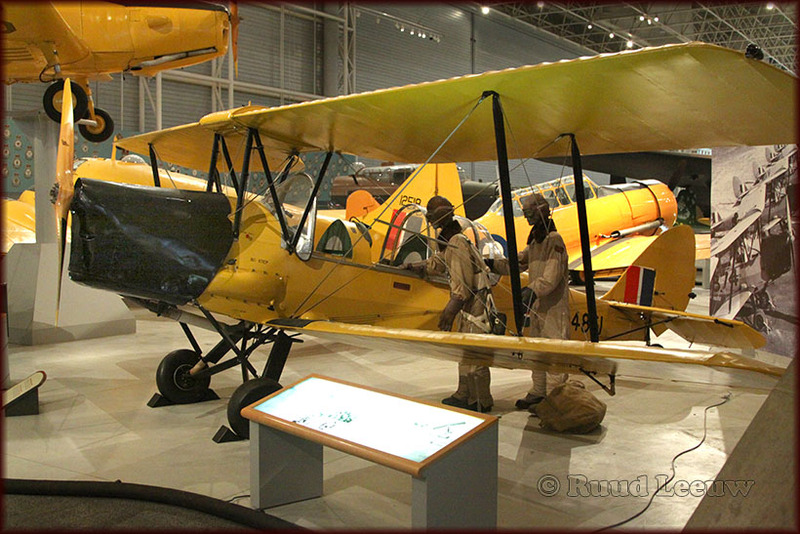 "Bert" Hinkler purchased a Puss Moth in 1931 and flew solo from Toronto to England via Brazil, Africa, and Europe! More about Hinkler on my Australia 2005 page. 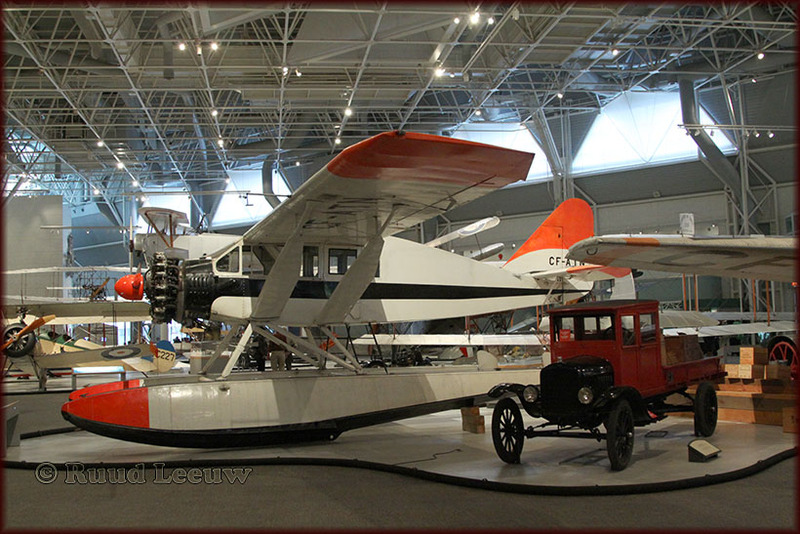 'CF-PEI' (c/n 2187) was manufactured in England in 1931 and went to the U.S. naval attache in London. 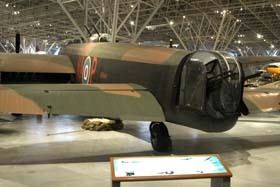 Serving with the RAF in Second World War, the Puss Moth flew with various U.K. civil operators before coming to Canada in 1969. It operated in Prince Edward Island until purchased by the Museum in 1976. Previous identities were: BuA8877, (DR630), HM534, G-AHLO. 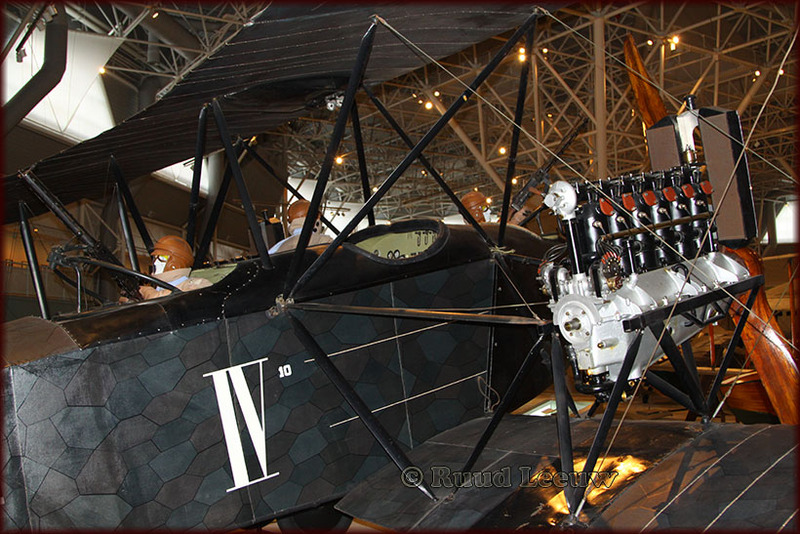 The prototype Stearman Model 4, designed by Lloyd Stearman and manufactured in Wichita,KS was 1st flown on 21Sep1929. 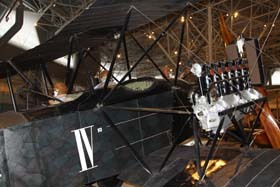 The model 4 was available as a 3-seater open-cockpit mailplane, the 4 EM (M for Mail). The 4EM could carry 272 kgs (600 lb) of mail in 2 covered metal-lined fire-resistant cargo hold which replaced the passenger space of the 3-seater version. C/n 4021 was built as a Model 4E in 1930. It operated as a corporate aircraft until modified to a cropduster in 1944. 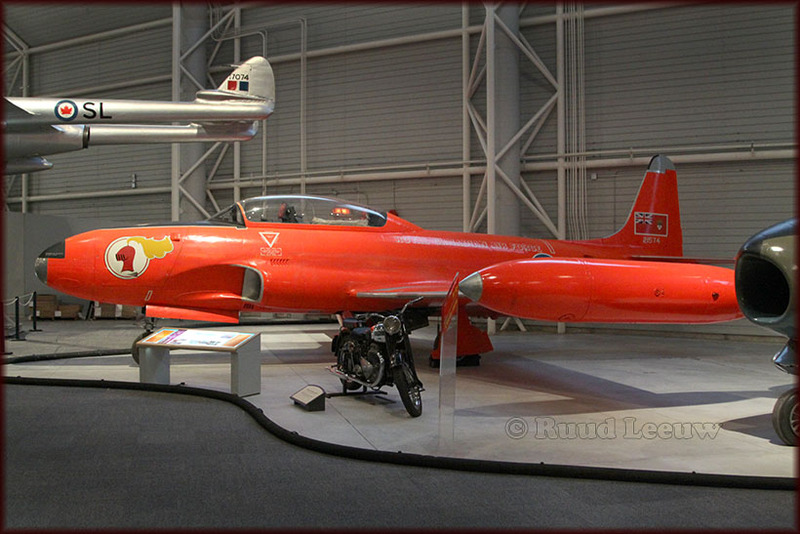 Imported into Canada in 1965, it was restored as a Model 4EM and flown in 1969. 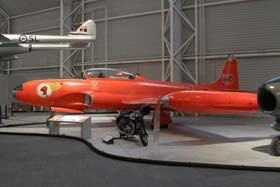 The aircraft was presented to the Museum in 1970. 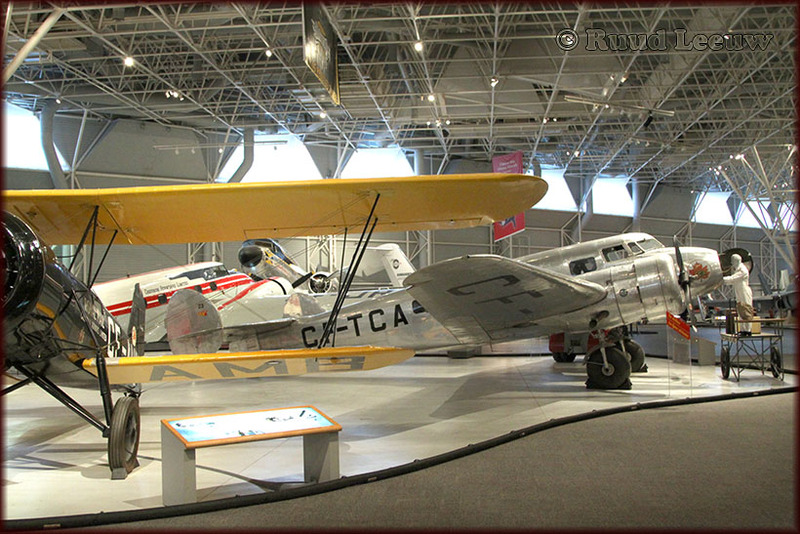 CF-ODR has been on display until recent years in the Warplane Heritage Museum, Hamilton, Ontario. 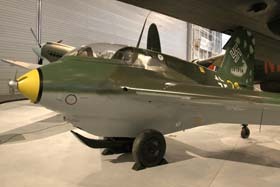 C/n 28 was converted to Super Widgeon standard. 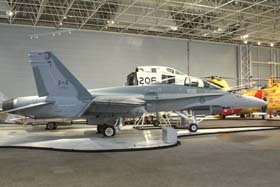 Formerly used in Northern Ontario and donated to the Canadian Warplane Heritage Museum in 2001. 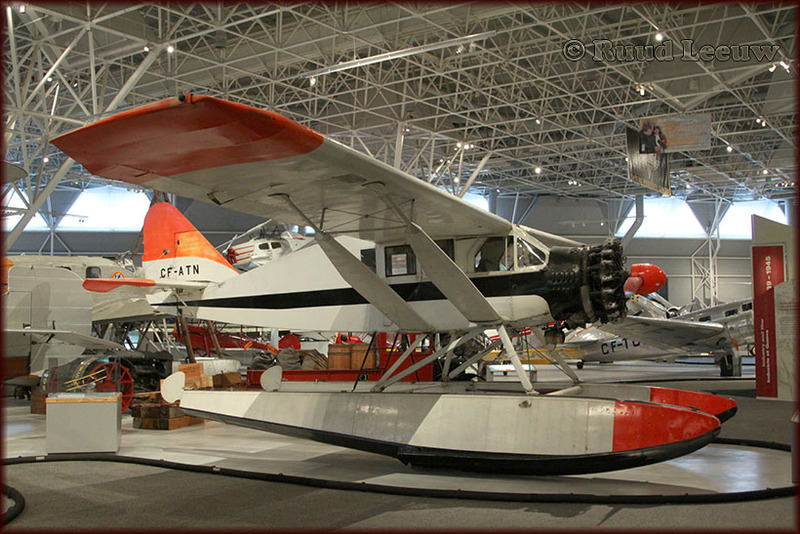 The Grumman G-44 Widgeon is a small, 5-person, twin-engine amphibious aircraft. It was designated J4F by the United States Navy and Coast Guard and OA-14 by the United States Army Air Corps and United States Army Air Forces. The Widgeon was originally designed for the civil market. It is smaller but otherwise similar to Grumman's earlier G-21 Goose, and was produced from 1941 to 1955. 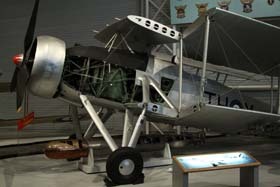 The aircraft was used during World War II as a small patrol and utility machine by the United States Navy, US Coast Guard and by the Royal Navy. McKinnon Enterprises at Sandy, Oregon converted over 70 Widgeons to 'Super Widgeons'. 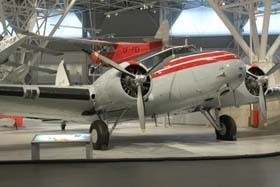 The conversion features replacing the engines with 270 hp (201 kW) Avco Lycoming GO-480-B1D flat six piston engines, and various other modifications, includng modern avionics, 3-bladed propellers, larger windows, improved soundproofing, emergency exits, and increased Maximum Takeoff Weight. Retractable wing-tip floats are optional. C/n 28 is quoted to be a SCAN 30: a batch of 41 G-44s licence-built in France. The 10A, Lockheed’s first all-metal design, was a relatively small twin-engine transport which followed the trend set by the Boeing 247. The two Lockheed 10As that began service in 1936 with Canadian Airways on the Vancouver-Seattle route were Canada’s first modern airliners. 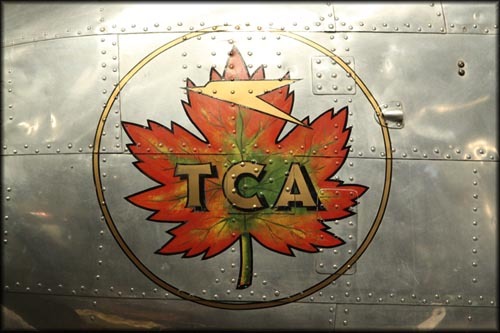 CF-TCA was manufactured in 1937 and was the 1st new aircraft purchased by Trans-Canada Air Lines. 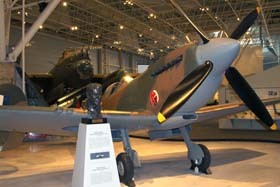 It served with the company until transferred to the RCAF in 1939. Sold in 1941 to a private operator, it was flown until 1967 by various owners. 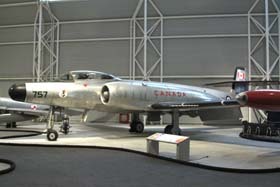 Air Canada restored the aircraft in 1968 and donated it to the Museum. In 1937 Amelia Earhart was flying a Lockheed 10E on a round-the-world flight when she was lost over the Pacific Ocean. 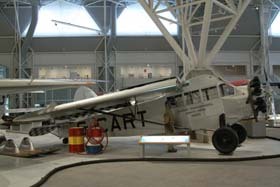 The Museum aircraft was flown around the world by Ann Pellegreno between June 7 and 10Jul1967, to commemorate Earhart’s last flight. the flight of the revolutionary Boeing 247 on 08Feb1933 marked the birth of the modern airliner. 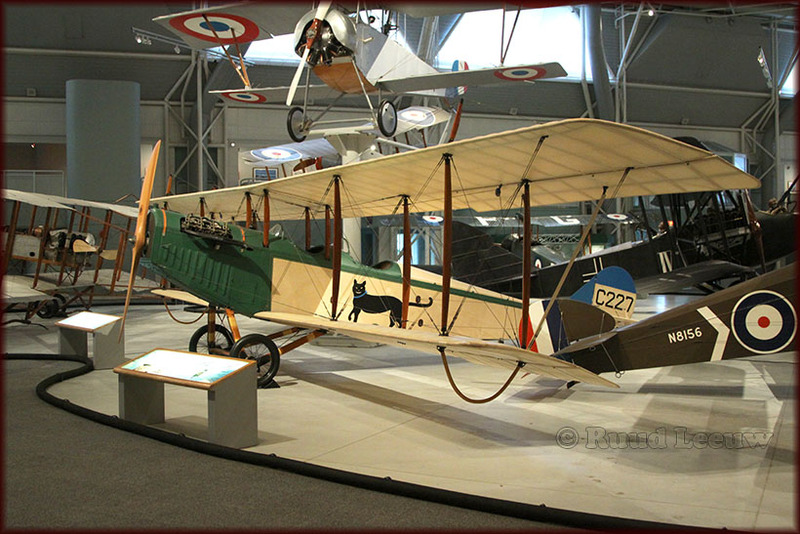 A cantilever, low-wing monoplane with a retractable undercarriage, the 247 made a striking contrast to the biplanes and high-winged monoplanes then used by most of the world's major airlines.Comfort and safety features of several other aircraft were combined in this tough, dependable machine; it sintroduction marked the beginnings of the multi-engine, all-metal airliners equipped with air conditioning, sound proofing, de-icing equipment and up-to-date navigation aids. Its greater range and cruising speed cut the trip from New York to San Francisco down to 20 hours, 7 1/2 hours less than the best time then possible. 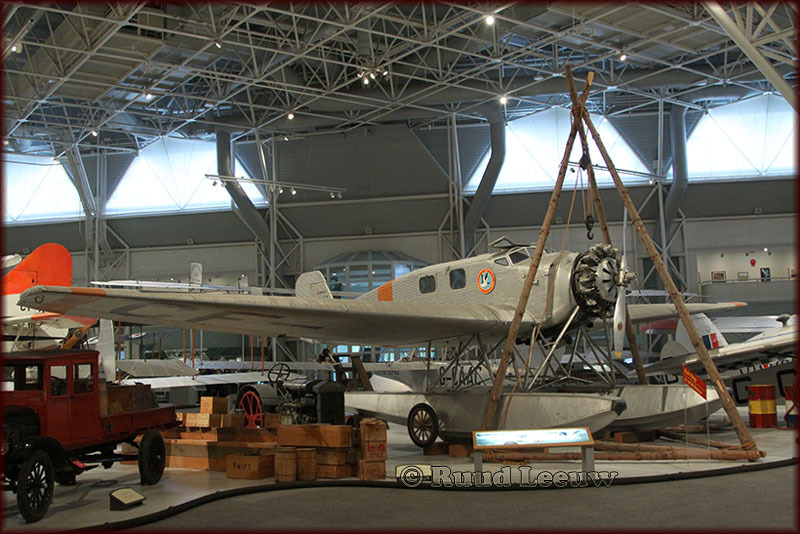 CF-JRQ was built as a Boeing 247 in 1934 and was converted to 247D standards in 1935. 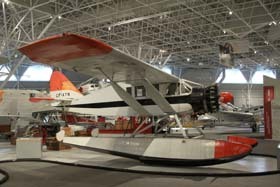 It flew for 13 different operators, including United Air Lines, the RCAF, Quebec Airways, and Canadian Pacific Airlines. It was donated to the Museum in 1967 by its last operator, California Standard Oil of Calgary, Alberta. 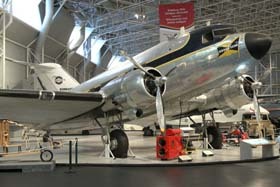 The DC series of aircraft was developed in response to the challenge posed by the Boeing 247 and culminated in the magnificent DC-3, the most successful air transport of all time. The DC-3 came into being almost by default. Douglas built a larger version of the DC-2 to contain berths for night flights. The result, called the Douglas Sleeper Transport, had a longer, wider fuselage. The DST was a limited success, but when its big fuselage was filled with passenger seats instead of berths, the DC-3 was born. A combined total of about 3000 DC-3s were built under licence in Japan and Russia. 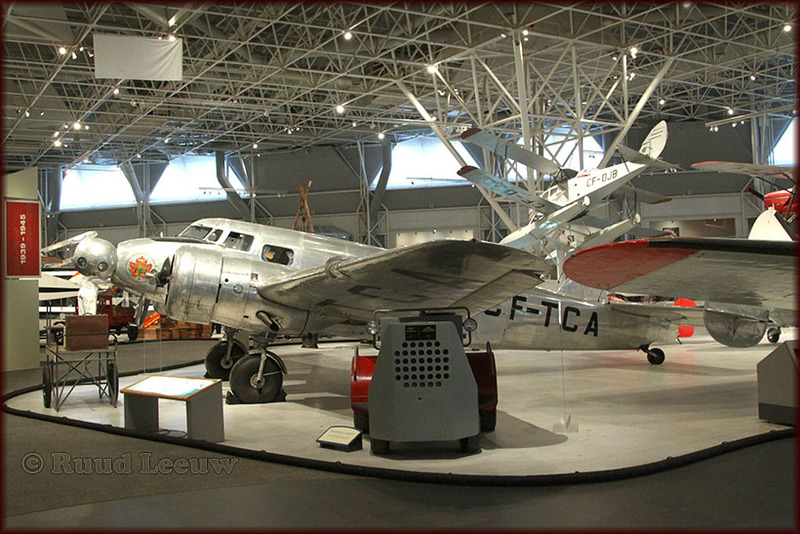 C-FTDJ (c/n 6261) was on civil order as a DC-3, prior to the attack on Pearl Harbour in 1941, when it was impressed into the U.S. Army Air Forces as a C-49J-DO. 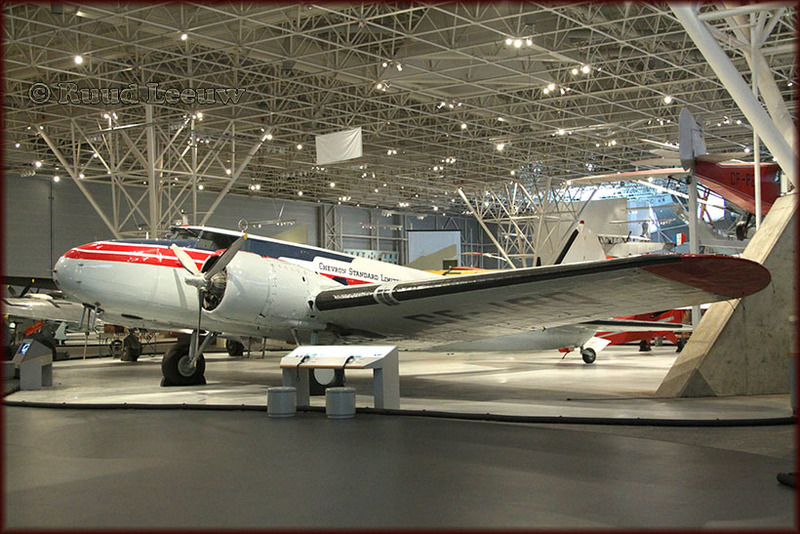 It was sold to Trans-Canada Air Lines, its first DC-3 acquisition, in 1945. 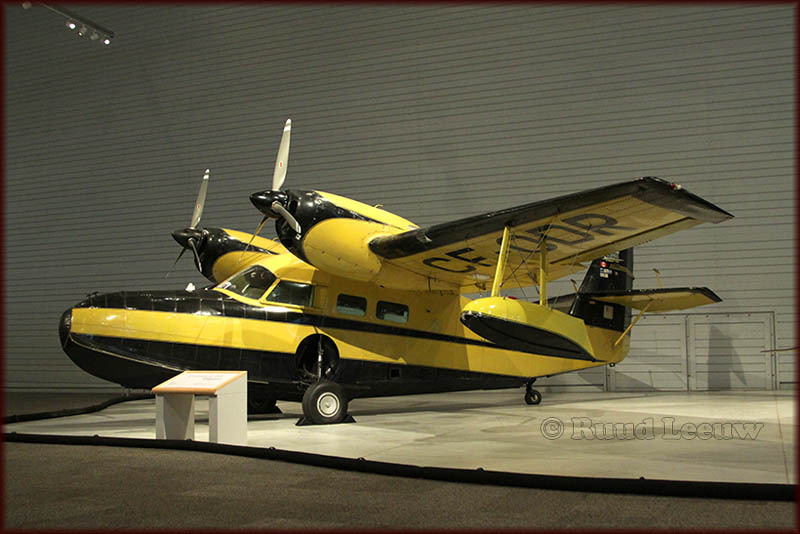 Goodyear Tire and Rubber Company bought the aircraft in 1948 and flew it until 1983, when the company presented it to the Museum. Fleet trainers were made in Canada from 1930 to 1941 in models 2, 7, 10, and 16 for the RCAF and civil operators, and were exported to nine countries. 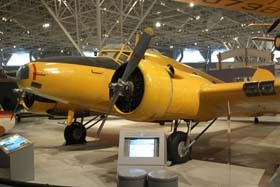 The model 16 was designed especially for primary pilot training in the RCAF. 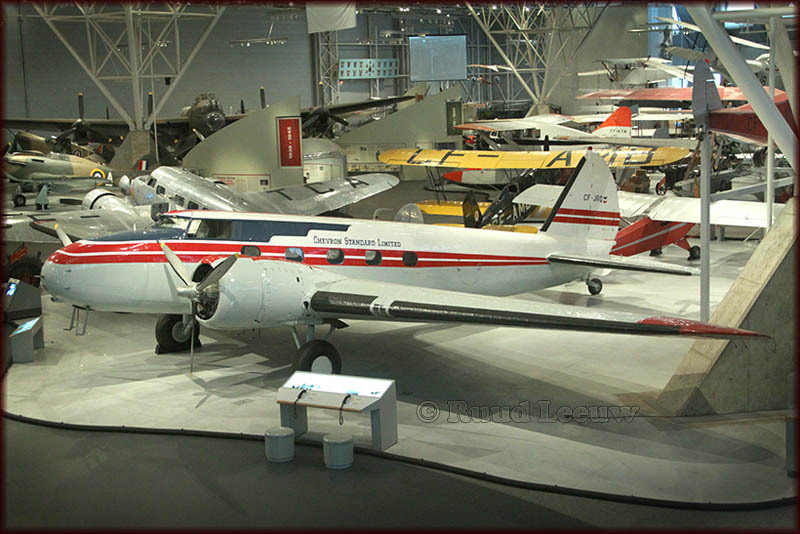 From 1943 on, the Finch was gradually replaced by the Fairchild Cornell. One of the best advanced training aircraft ever built, the Harvard became a mainstay of the British Commonwealth Air Training Plan (BCATP). 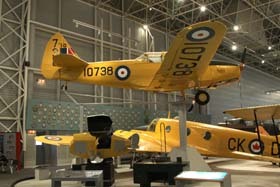 Harvard IIBs were first ordered from Noorduyn in Montreal in January 1940. 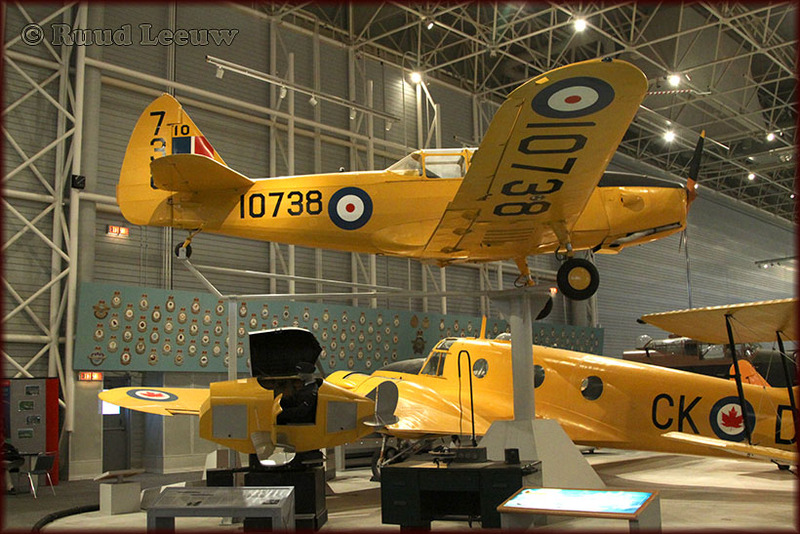 Noorduyn eventually built 2.800 Harvards for the RAF and RCAF. Noorduyn became Canadian Car and Foundry, which made 550 Mk.4s for Canada and the US in the 1950s. 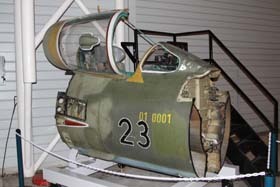 The Mk.4 had an improved cockpit canopy and greater fuel capacity. The Harvard is a popular 'warbird' these days in hands of privat operators and preservation groups. 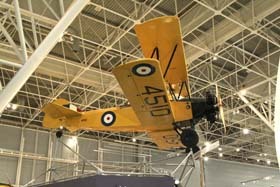 The Fairchild Cornell was the successor to the Tiger Moth and Fleet Finch for elementary pilot training in the British Commonwealth Air Training Plan . 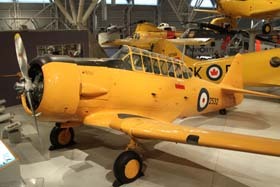 The RCAF version, which served until 1947, was the Cornell III, manufactured by Fleet Aircraft, Fort Erie, Ontario. 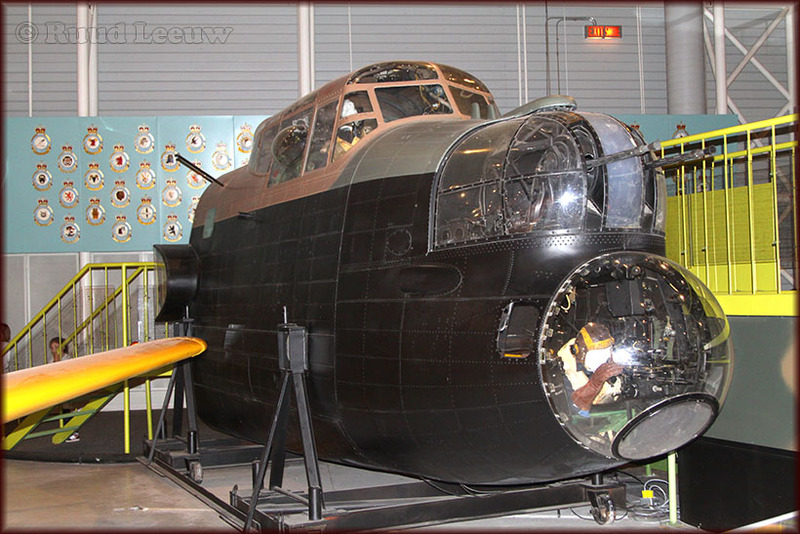 In late 1943 a series of wing failures occurred, requiring reinforcement of the main spar. After the war many Cornells were sold for civilian use, but the wing spar problem continued and required stringent annual inspections. This weakness greatly reduced their popularity. Although Cornells were also manufactured in Canada for the US Army Air Forces, none was delivered there! 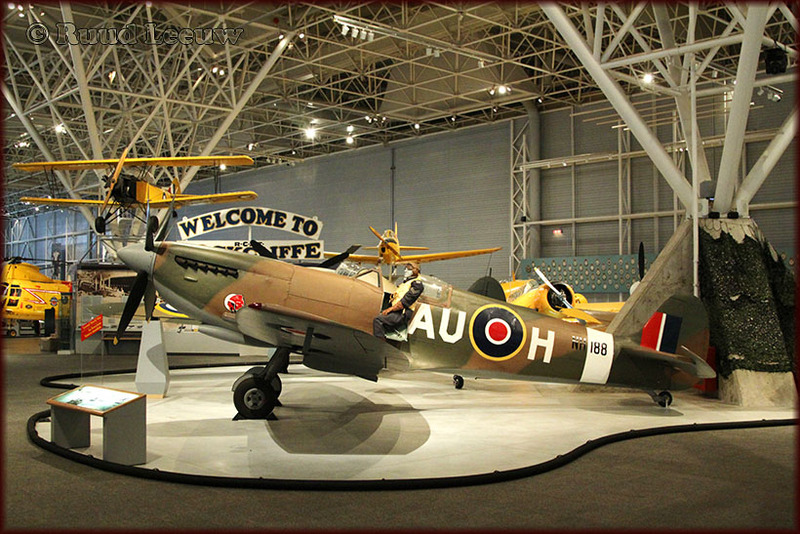 Most of the US Army Air Forces order was sent to the RAF, under lend-lease, with the balance going to the RCAF. 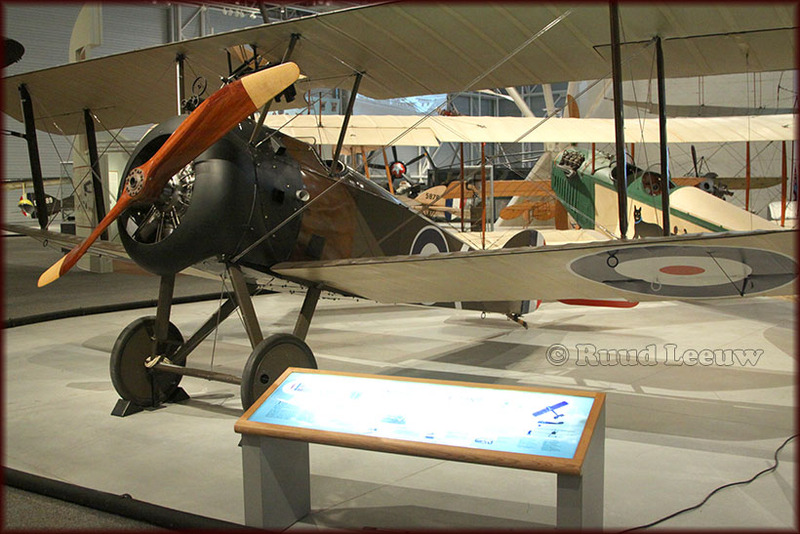 20 Canadian-built Cornells were used by the Royal Norwegian Air Force at their two wartime bases in Ontario. 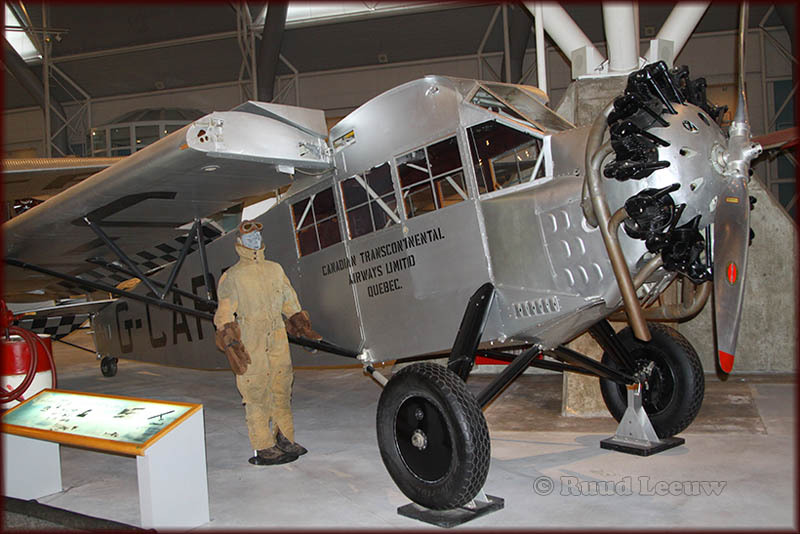 Some Canadian-built Cornell IIs were shipped to Africa and India to be used in training schools. 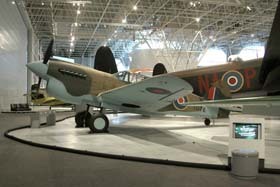 10738 was manufactured in 1942 and flew with the RCAF until 1944. It was placed in various storage locations until 1964, when it was transferred to the Museum. 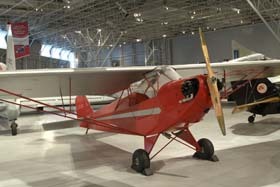 The particular aircraft, a Cirrus Moth, was delivered to Canada in 1928. It flew commercially for several years, then went to private owners and flew until stored in 1942. 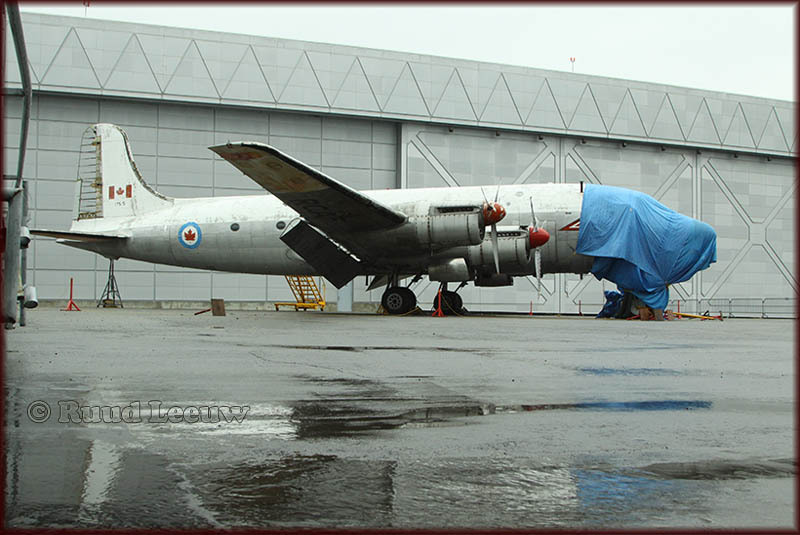 It was donated to the Museum in 1962 and restored at de Havilland Canada by volunteer employees. The original 3 Ansons were built to civil specifications. The design was then modified for RAF use on coastal patrols. 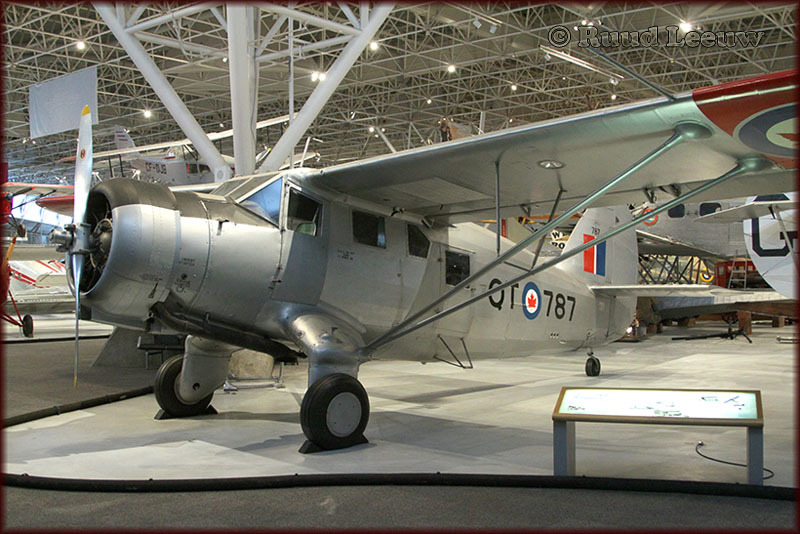 Early in World War II, the Anson was selected as the standard twin-engine aircrew trainer for the British Commonwealth Air Training Plan (BCATP). 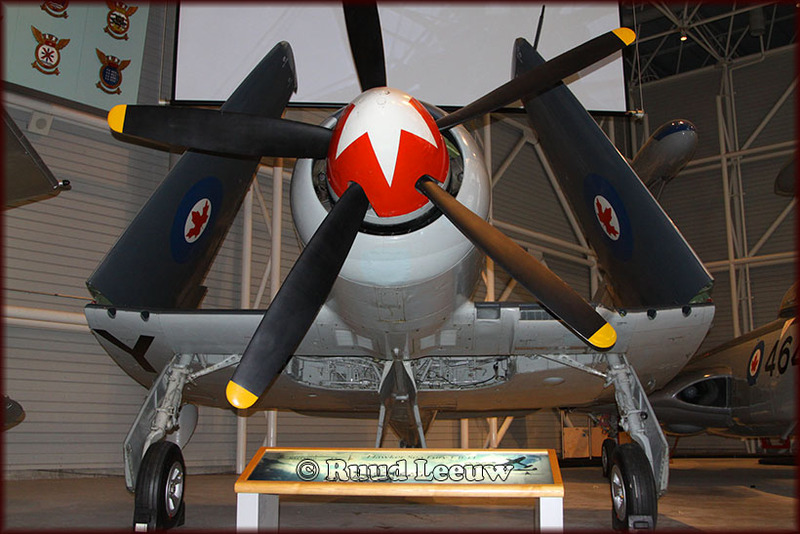 12518 entered the RCAF in June, 1945 and was retired in 1954. 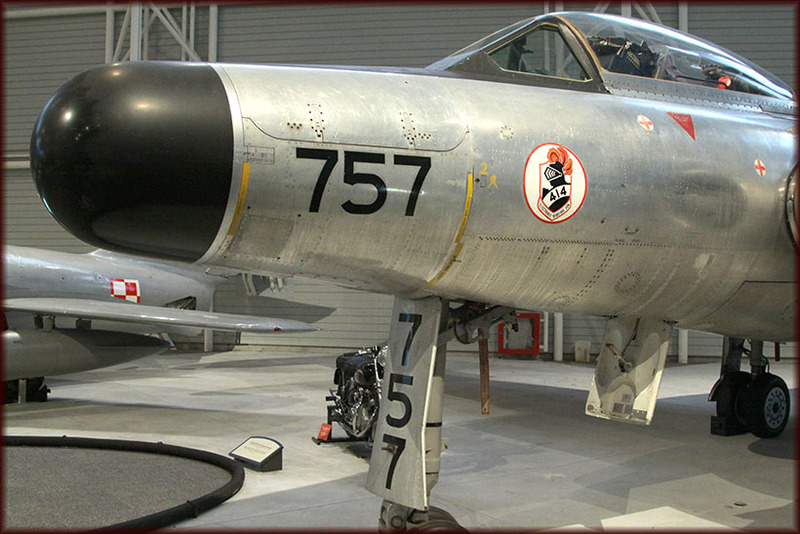 It remained in storage until 1964 when it was selected for preservation at the museum. 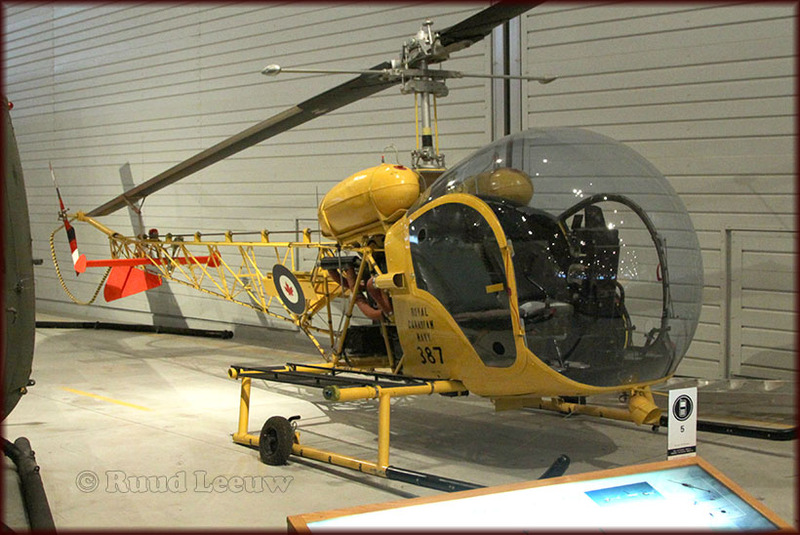 In 1946, the Bell 47 became the first helicopter to be licensed for civil operation. In January 1947 it was the first commercial helicopter to be delivered to an operator. Production for civil and military use continued until 1973. The aircraft nomenclature system introduced by the U.S. Army during the 1950s included the letters HU, which stood for 'helicopter utility'. 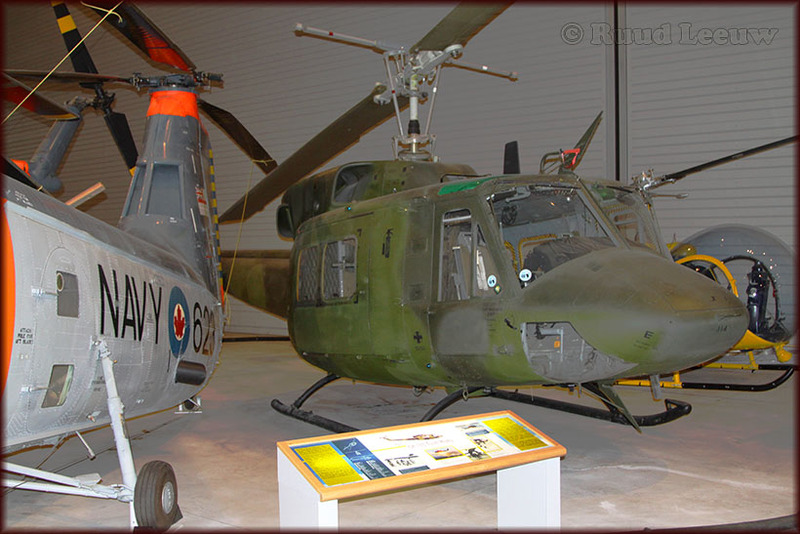 From this, the famous but unofficial nickname 'Huey' was derived for the Bell UH-1 Iroquois as the Twin Huey. 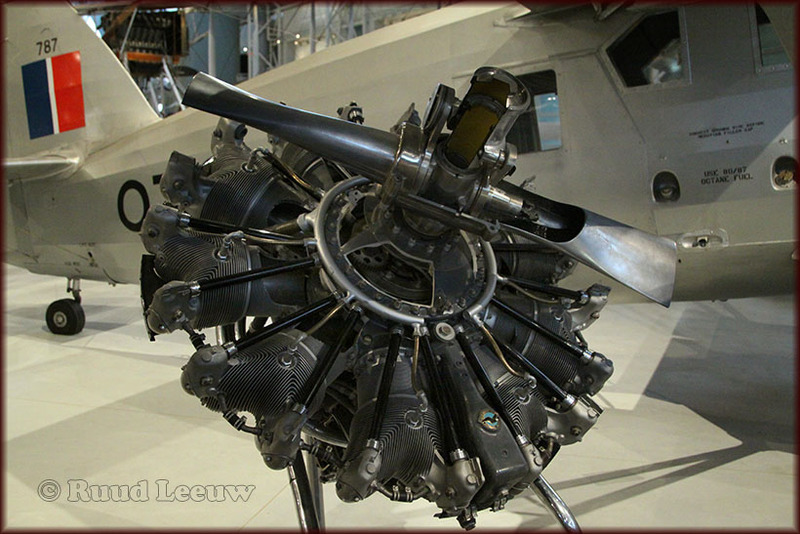 An American design, it was developed to Canadian specifications and utilized Canadian-built turbine engines. Entering armed forces service in 1971, it has subsequently been purchased by military and civilian operators worldwide. The HUP-3 was built to a US Navy requirement for a carrier-based helicopter for search-and-rescue and general transportation. 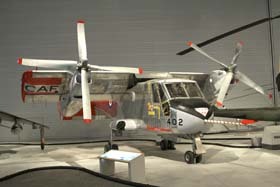 70 similar aircraft went to the US Army under the designation H-25A. 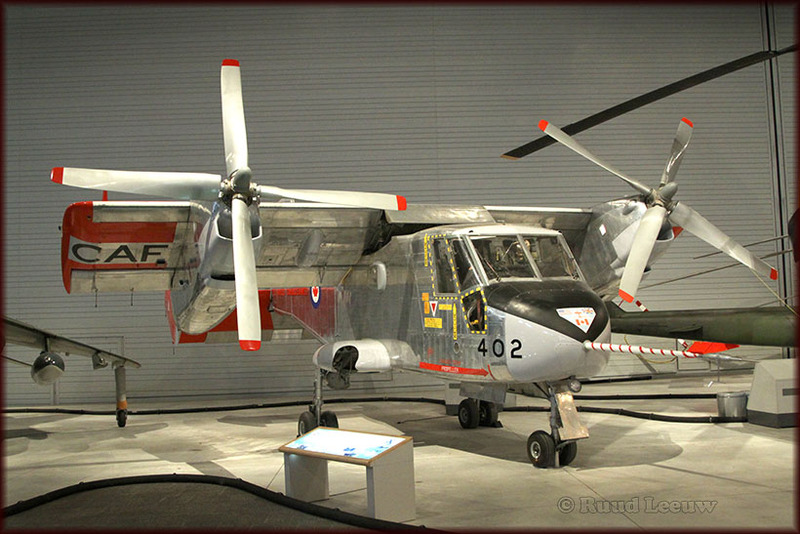 Considered too small, 50 were transferred to the US Navy as the HUP-3. 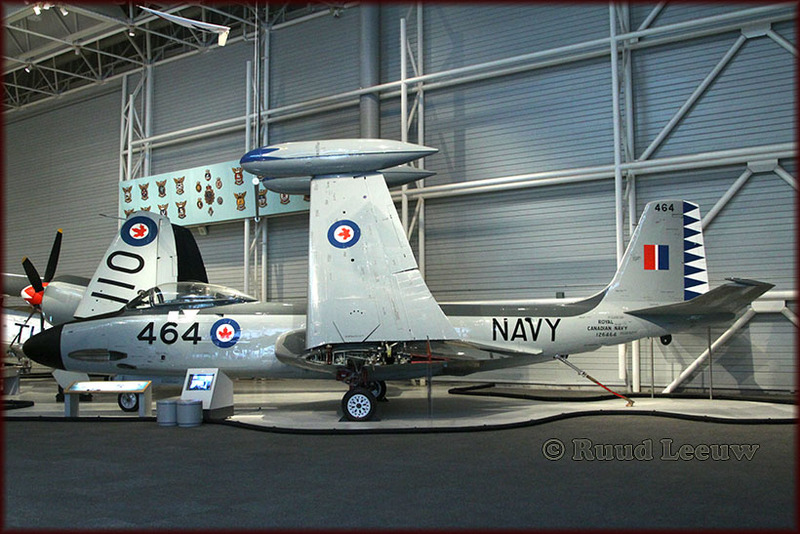 The Royal Canadian Navy received 3 HUP-3s in 1954. Operating from HMCS Labrador in northern Canadian waters, they reported on ice conditions and conducted hydrographic and oceanographic surveys. 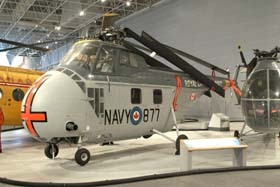 The RCN HUP-3s were retired in 1964. 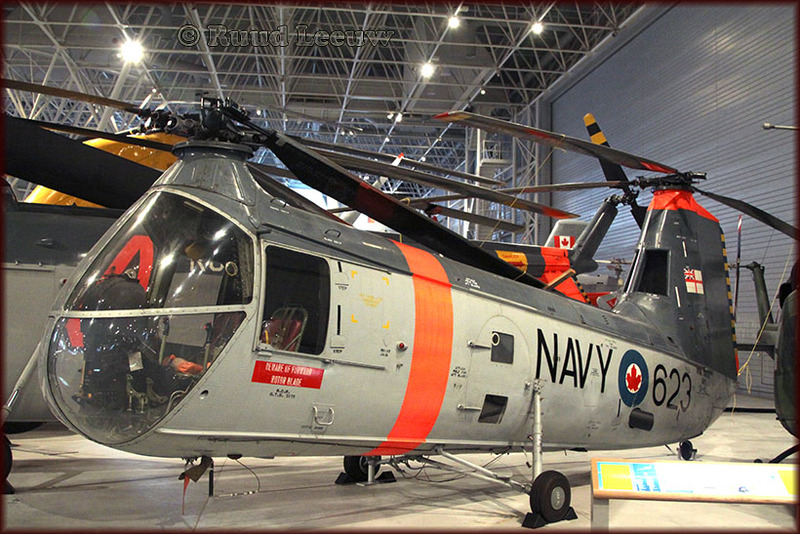 The S-55 was the first helicopter with both the space and power to carry large loads. It was in heavy demand by both civil and military operators. 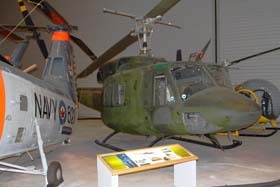 Okanagan Helicopters operated 21 S-55s while the RCAF flew 15 transport versions and the RCN operated 13 HO4S-3. A total of 1 100 were built in the United States and a further 550 in other countries. 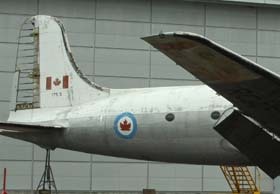 The HO4S-3 retired from Canadian service in 1970. 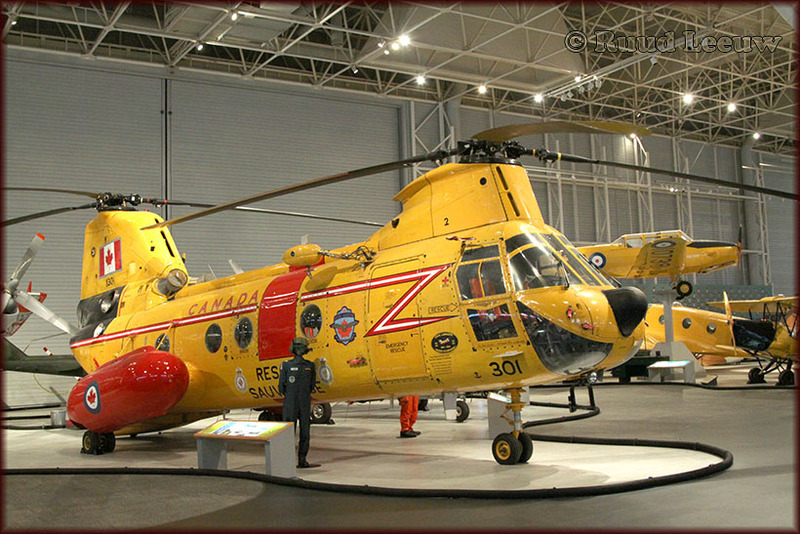 This aircraft is a twin-engine, tandem-rotor search and rescue (SAR) helicopter used by the Canadian Forces from 1963 until 2004. 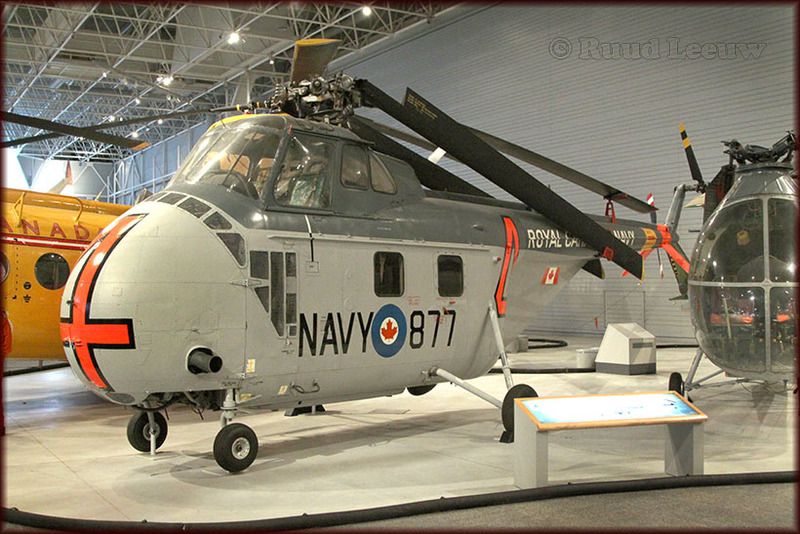 It was a variant of the Boeing Vertol CH-46 Sea Knight designed and built in the United States. A search and rescue version was purchased by the Royal Canadian Air Force in the early 1960s and became known as the Labrador. Soon after, the Canadian Army acquired a troop and cargo version known as the Voyageur. The CL-84’s experimental “tilt-wing“ design was an attempt to produce an aircraft that would combine vertical take-off-and-landing with a low-speed, fixed-wing capability. Four CL-84s were constructed. Two crashed through mechanical failure, but with no loss of life. No production contracts were procured and work on the design was halted. 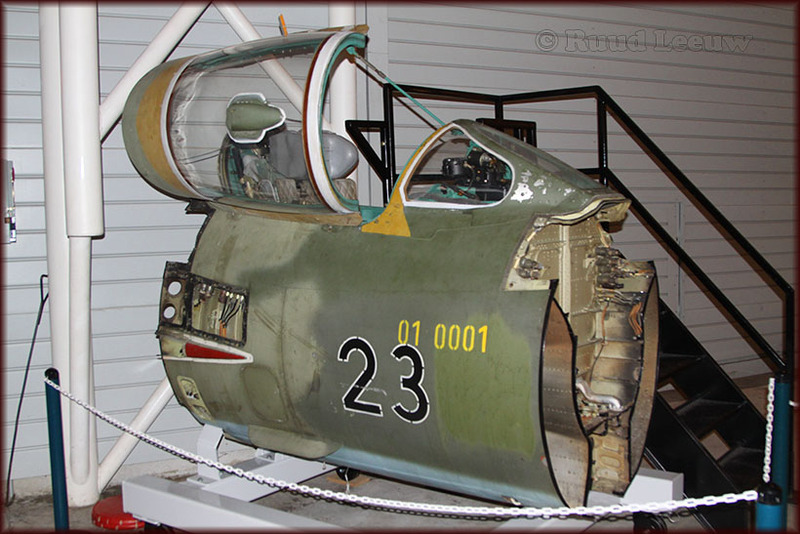 Andrew Kirfman, Aircraft Examiner (Components), volunteered (Sep.2011): "This appears to be the cockpit section of a MIG-21. Not sure what type or model, probably an early model. 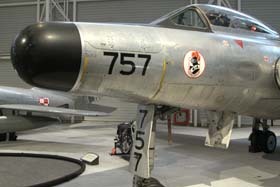 The early MIG-21’s canopy opened to the right with a prop bar such as this one has. Don't know what the construction number or serial number could be." Pitts Specials carry a high profile in the world of sport aviation as they are acknowledged to be one of the world’s leading aerobatic aircraft, winning more competitions than any other type in history. These nimble aircraft incorporate different upper and lower wing sections that provide inverted performance equal to conventional “right side up” flight. This wing design also facilitates outside loops. The original Pitts design dates from the early 1940s and over the years more powerful engines and various aerodynamic modifications have led to several models that are capable of unlimited aerobatics carrying two persons. 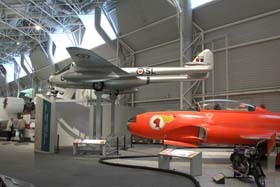 The Museum’s example is the last surviving aircraft from the famous Carling Red Cap civilian aerobatic team of the 1970s. It has been flown on a regular basis since and over the years has been modified to incorporate changes made to later models. 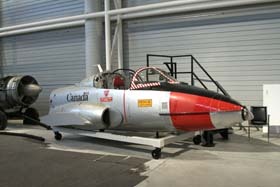 It flew as a member of successor aerobatic teams such as the Canadian Reds and the Ray-Ban Golds. Throughout its operational career, its spectacular performances have inspired many young Canadians to become involved in aviation. Its present finish and markings reflect its last years as a member of the Ray-Ban Golds. 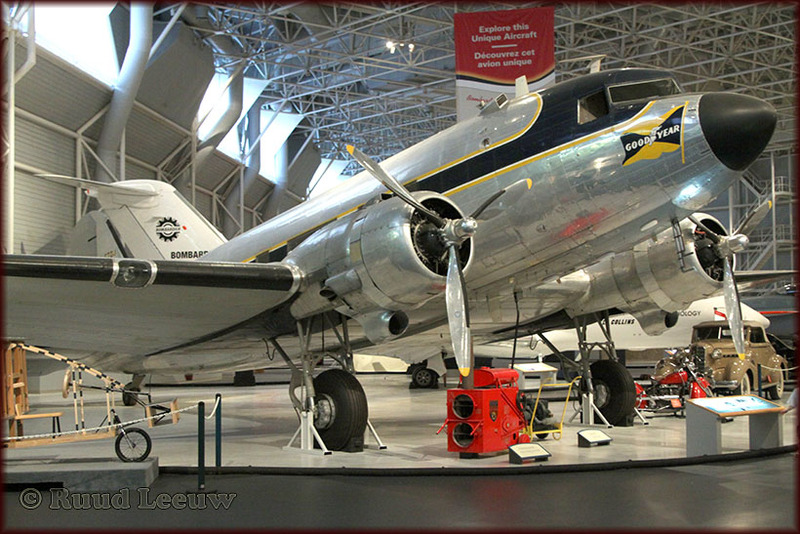 The North Star was a Canadian development of the Douglas C-54/DC-4, with some features of the DC-6. 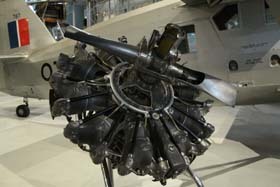 The aircraft were equipped with Rolls Royce Merlin engines. 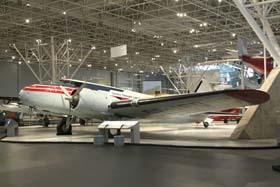 The North Star served dependably with Trans-Canada Air Lines, Canadian Pacific Airlines, British Overseas Airways Corporation (BOAC), and the RCAF. The final version of the North Star was the C-5 with radial engines. Only one was built. Many North Stars continued to fly with small commercial operators after retirement from major carriers. RCAF North Stars were retired in 1966. 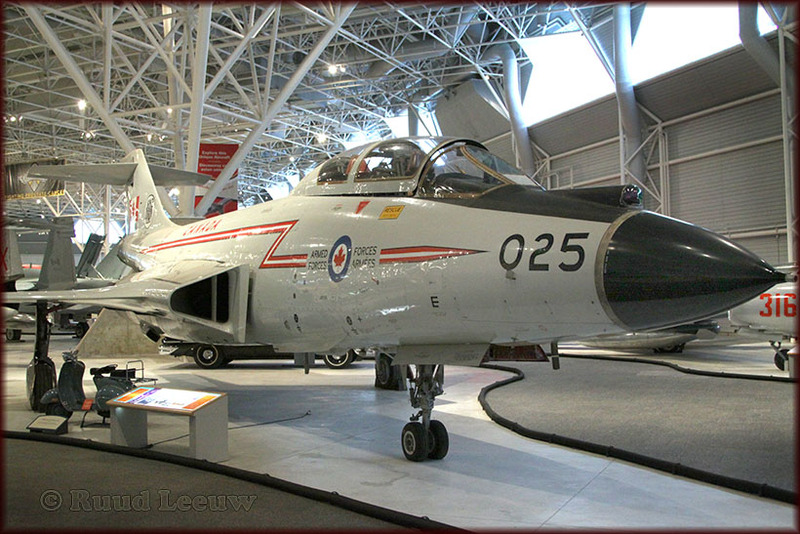 Civilian North Stars were pressurized while RCAF versions were not. Passengers found them very uncomfortable because of the noisy exhaust system of the original in-line engines. A special cross-over exhaust was developed by T.C.A. in a partially successful attempt to lower noise levels. The RCAF made no attempt to quieten their North Stars. 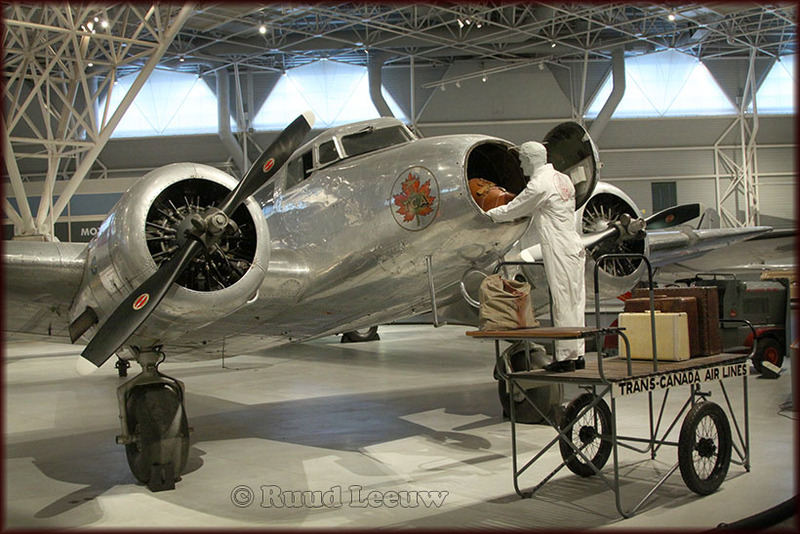 An article in the Ottawa Citizen july 2014 showed this North Star indoors, in restoration. 17515 was manufactured in 1948 and served with No. 426 Squadron (RCAF) until 1962. It was transferred to the Museum in 1966. 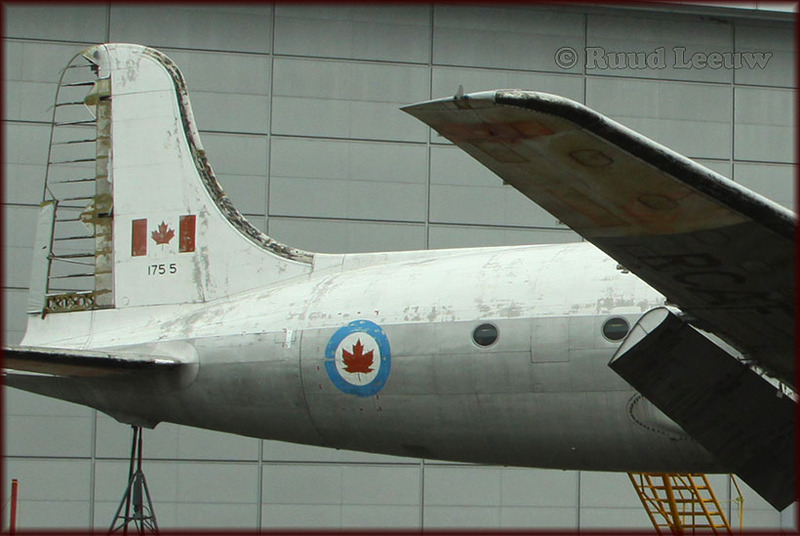 James Nelson wrote an extensive article on the Canadair North Star (a.k.a. Canadair Four, Argonaut), which was published in Air-Britain's Aviation World Winter 2010 issue. The article comprised 4 pages of text plus below handy Production List.